(Newburyport MA) Tantalizingly close to getting it done…….but not quite. 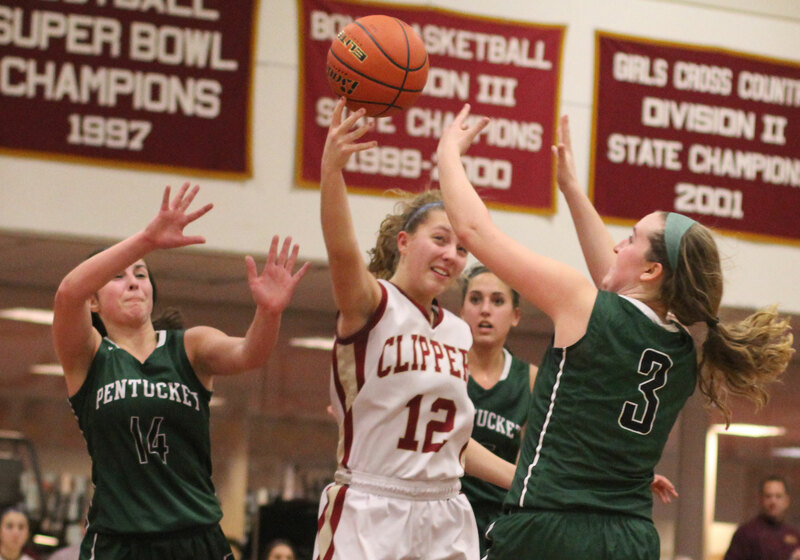 Instead Newburyport saw its losing streak to Pentucket reach thirteen as the Clippers fell to the Sachems, 43-40, on Friday night before a full house at Newburyport. 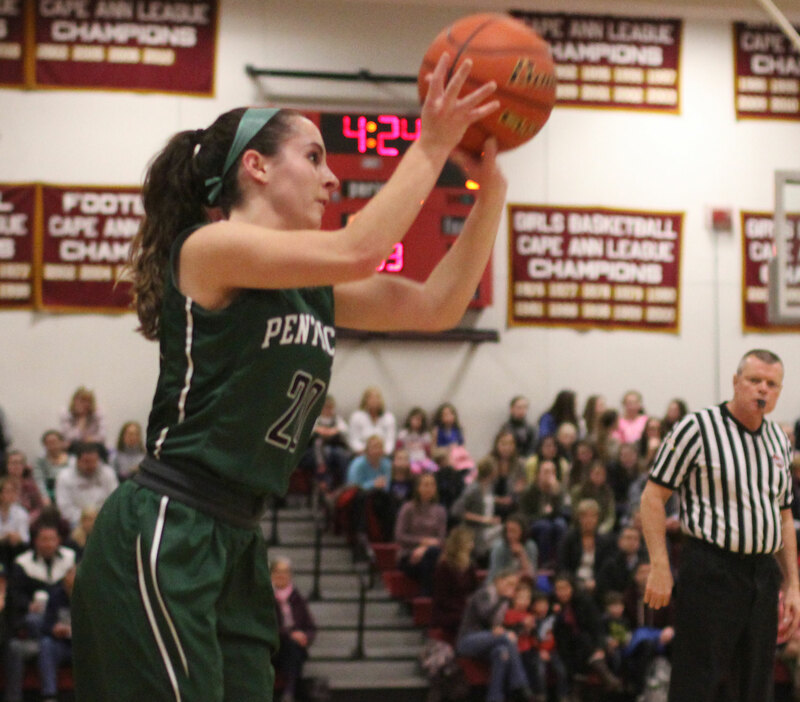 Pentucket (12-2) started the game with five straight points and in the final minute put five more points together to escape with the win. Plenty of quality man-to-man defense played by both squads. Most of the action was on the perimeter. 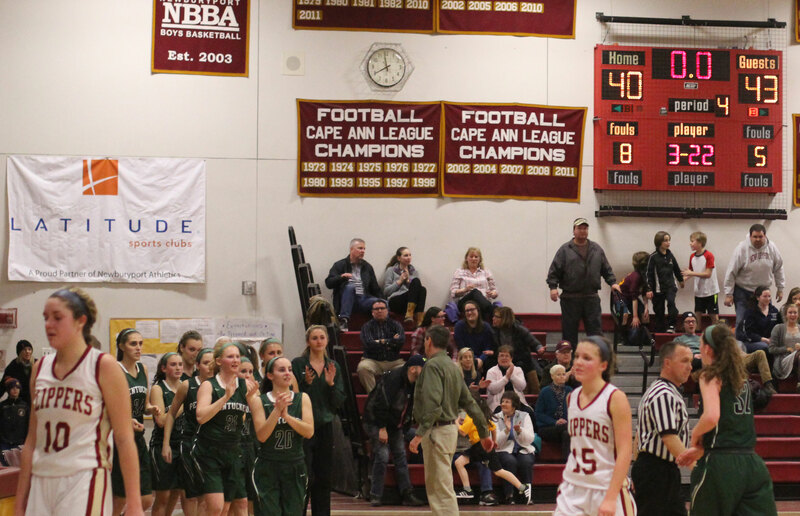 The Sachems were intent on keeping high-scoring Emily Pettigrew from doing too much damage. Every time Emily did get the ball inside there was an instant gathering of multiple defenders. Emily did get 14 points but three of them came in the last second when the game had been decided. Biggest shot of the game? 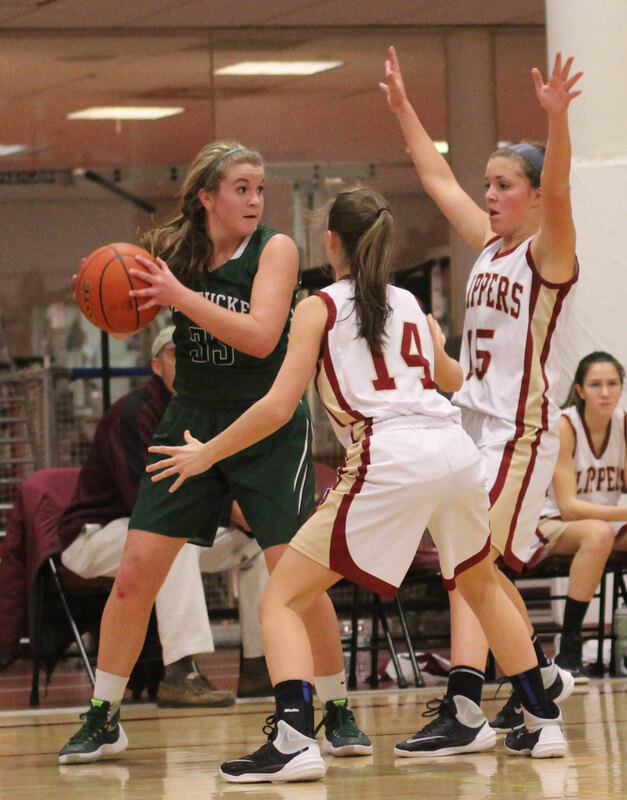 No question it was a three from in front of the Pentucket bench by junior Colleen Jameson. 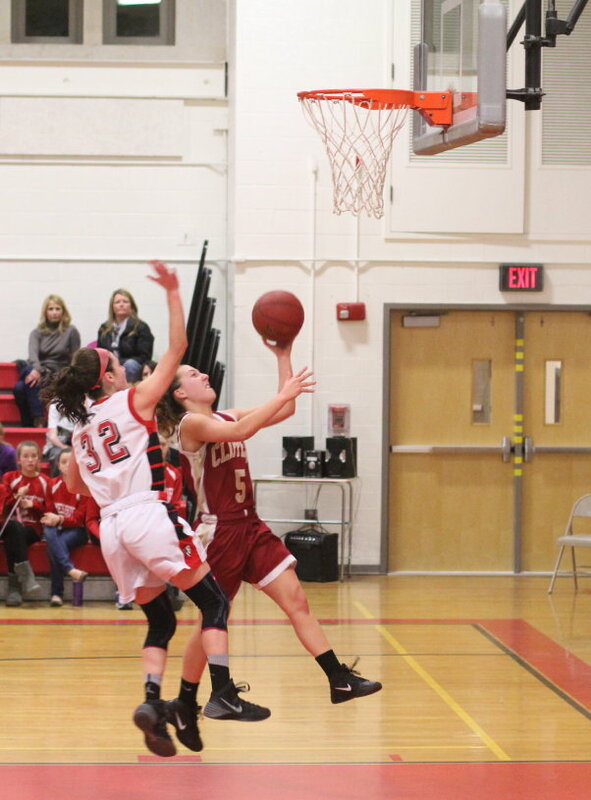 Colleen took a pass from Boo Torrisi and turned a one-point Sachem lead (38-37) into a much more comfortable 41-37 advantage. 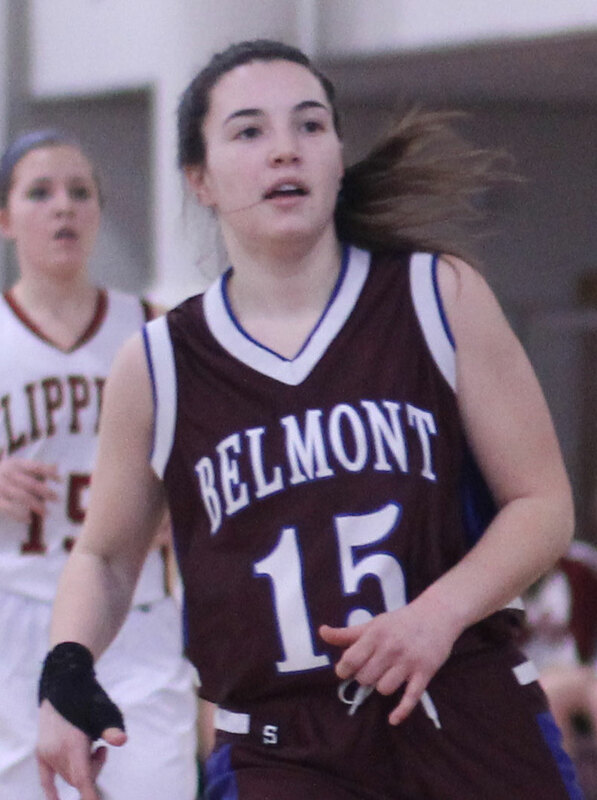 The Clippers would get two shots (Anna Hickman and Krysta Padellaro) to cut into their 4-point deficit but neither connected. 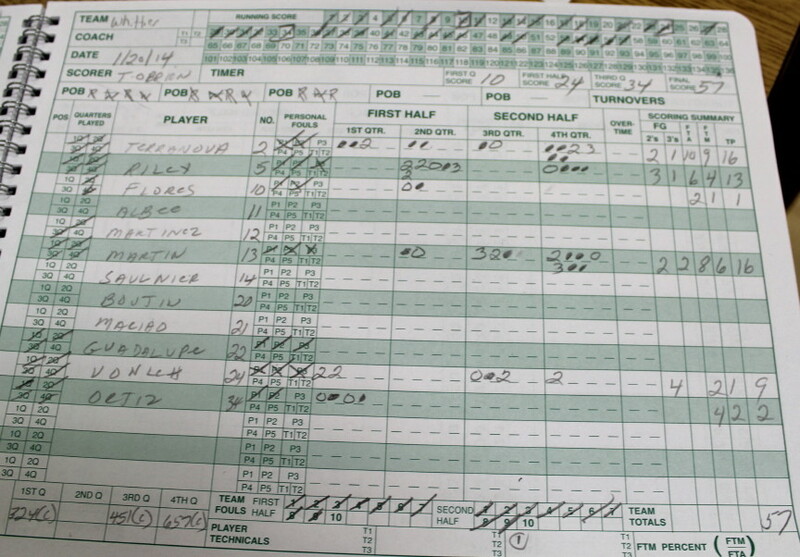 Carolyn Modlish (14 points) followed with two free throws with nine seconds left to seal the deal. Senior Boo Torrisi (11 points) had ten of those points in the second half. 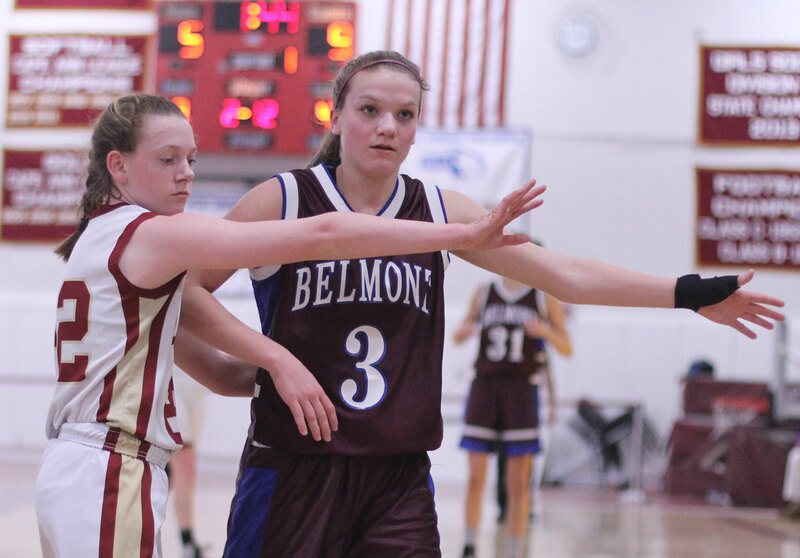 Her defense was noticeable as well as her willingness to take the ball to the basket. 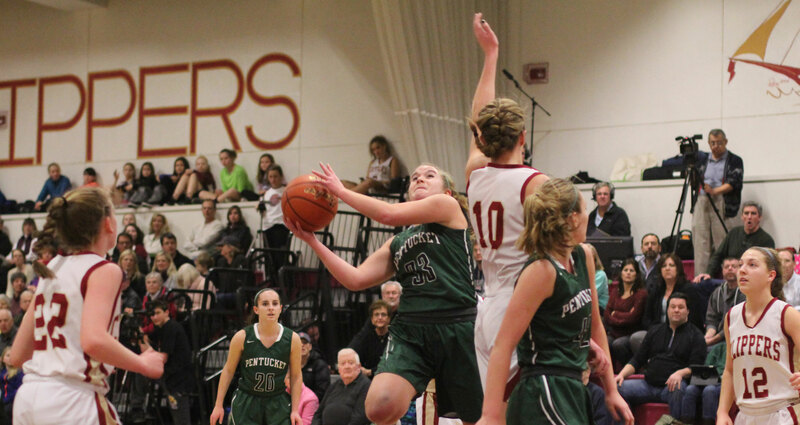 Pentucket did register sixteen turnovers, by my count, but after seeing them commit thirty-two miscues in a loss to Masco the improvement was significant. After trailing early, Newburyport (10-3) put nine straight together in the first period to get ahead, 11-7. 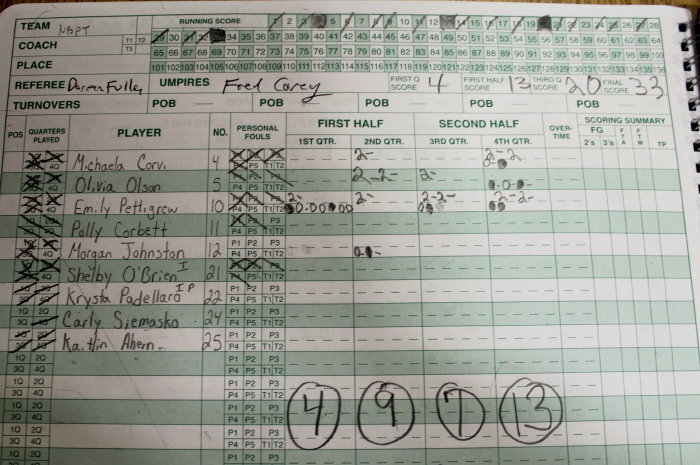 A three by Meghan Winn, a jump shot by Krysta Padellaro, and two inside scores by Emily Pettigrew provided the points. 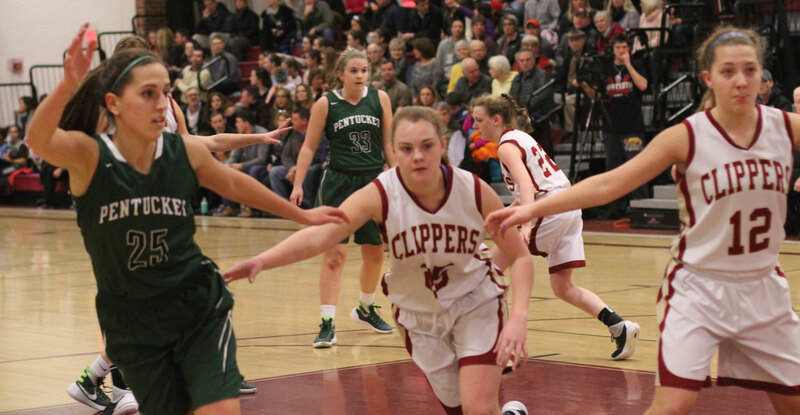 The Clippers carried a lead into the second quarter before it was Pentucket’s turn to run nine points of their own. Three’s did the trick. One each by Jess Galvin, Colleen Jameson, and Taylor Moore. Taylor’s was the old-fashioned kind. 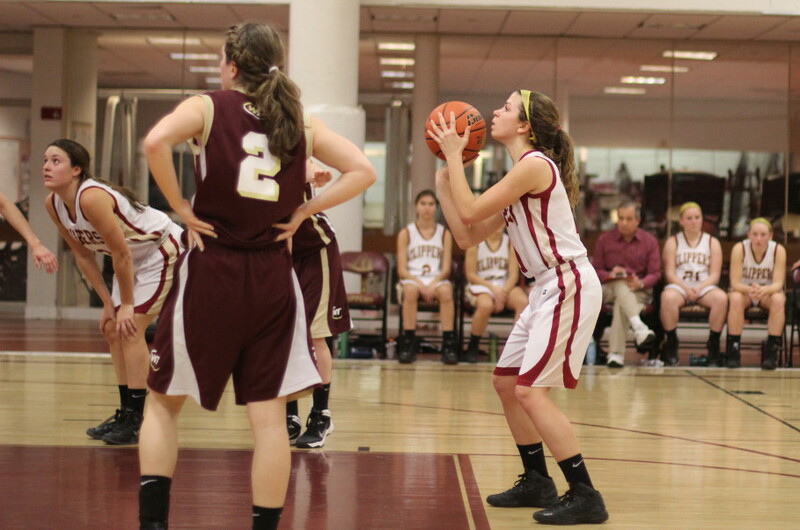 Taylor ended up with an extra free throw attempt after Newburyport committed a lane violation. The run of points gave the Sachem’s the lead, 20-17. The visitors would still be in front, 26-22, in the third before the Clippers put another nine-spot together. This time the damage was done with layups (Anna Hickman, Katie Hadden, and Krysta Padellaro) and a three from straight away by Krysta. 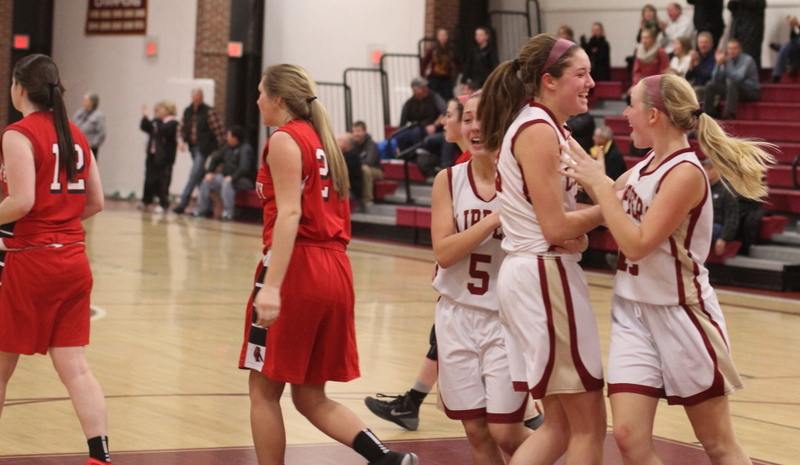 That flurry gave Newburyport a 31-26 advantage with 1 ½ minutes left in the third period. Pentucket followed with an 8-2 sequence, including two 3’s from Boo Torrisi, and now they were ahead (34-33) with 5:44 remaining. Two lead changes and a tie followed before Carolyn Modlish took a pass from Colleen Jameson in the lane and nailed a jumper to put Pentucket on top, 38-36, with 1:40 left. Freshman Anna Hickman had two free throws to tie the score ten second later but missed the second one. 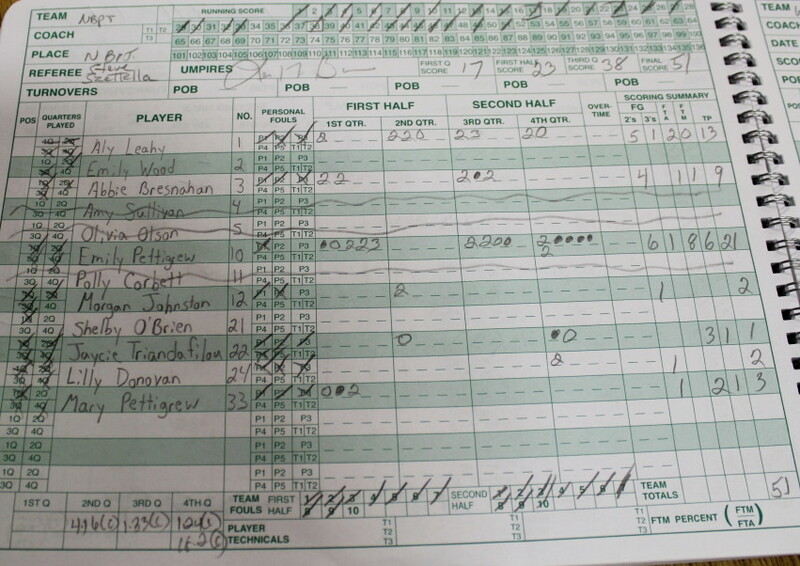 So Pentucket still had that slim one-point advantage going into the final minute. 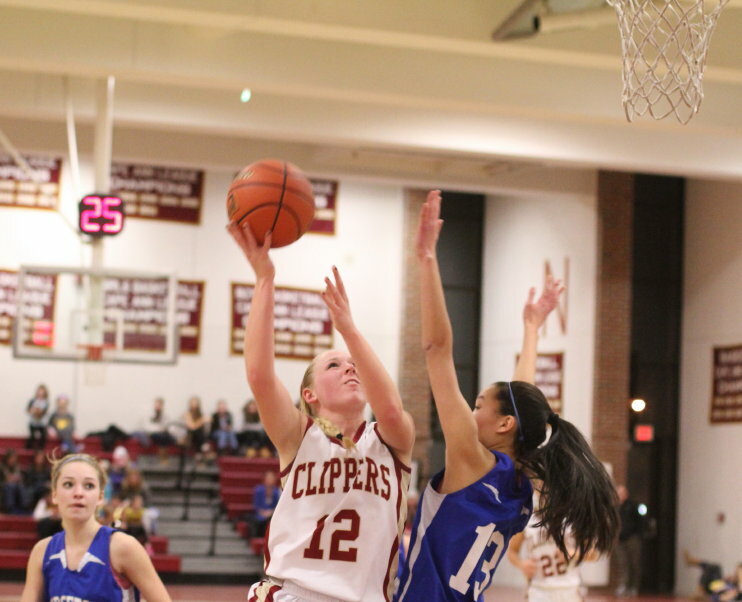 This was when Colleen hit the dagger-three the Clippers never recovered from. Impressed with the passing of Newburyport. They took very good care of the ball (14 turnovers) against a team known for forcing mistakes. Both teams were very good with the ball in their backcourts. 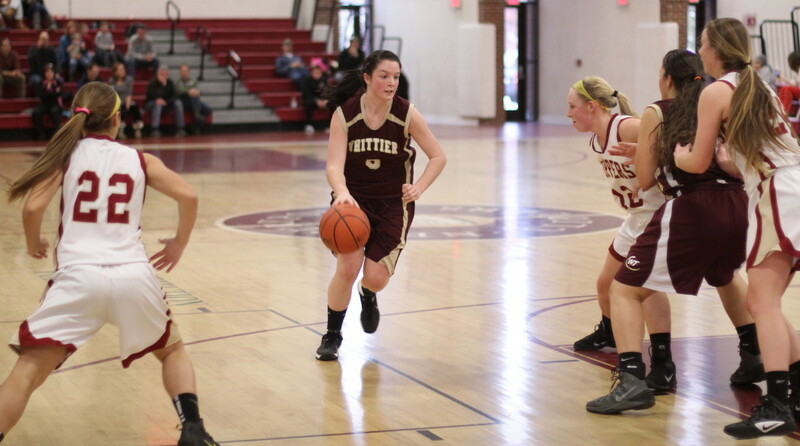 Sophomore Krysta Padellaro (14 points) showed terrific skills on both ends of the court. The Clippers certainly didn’t help themselves at the foul line. They missed nine-of-eighteen including the front end of two one-and-one’s. 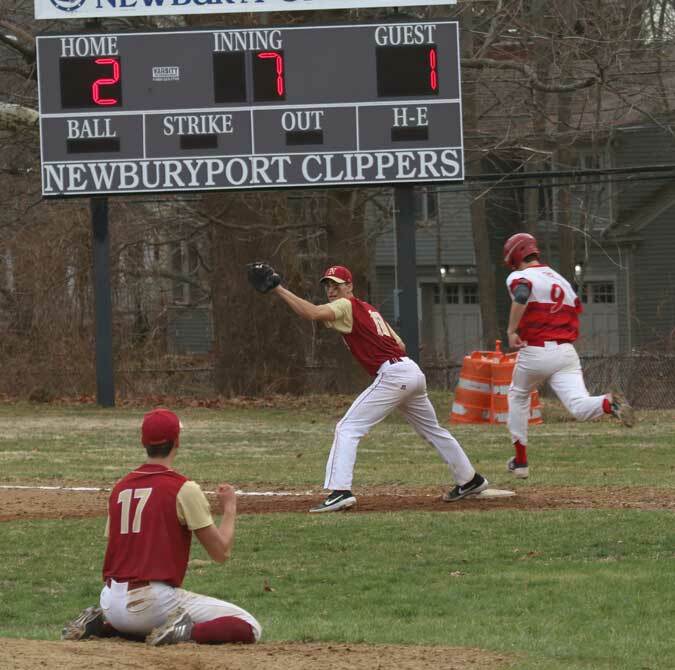 Newburyport lost their first two games of the season before going on a ten-game win streak and qualifying for the state tournament. Next for the Clippers with be an away tilt on Tuesday against North Reading. The Hornets were the other team to defeat the Clippers. 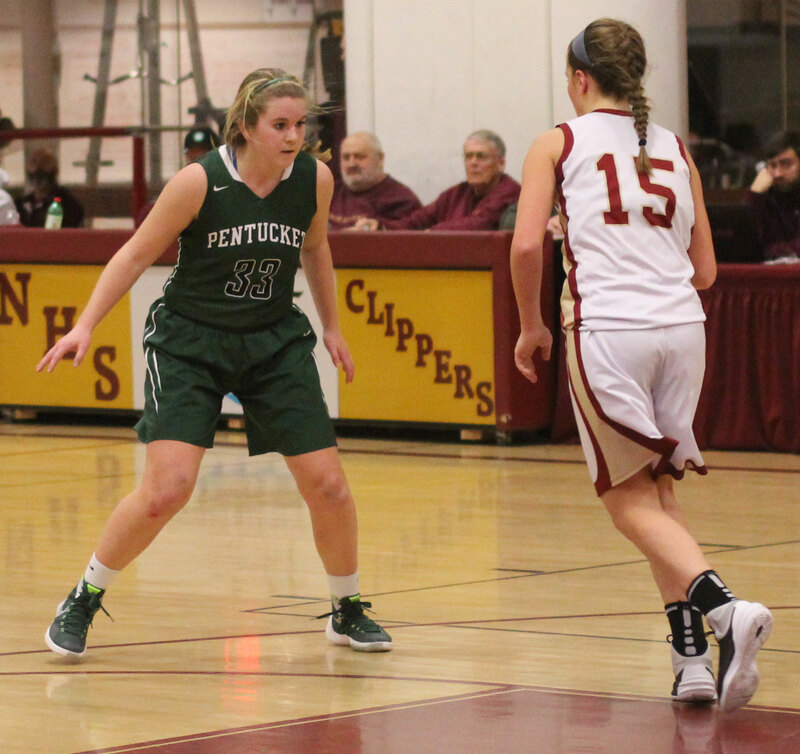 Senior Riley Holden was unavailable for Pentucket because of back issues similar to the ones that kept her off the court last season. Pentucket will face Lynnfield next, also on Tuesday. The Sachems mauled the Pioneers, 68-26, in their first meeting. 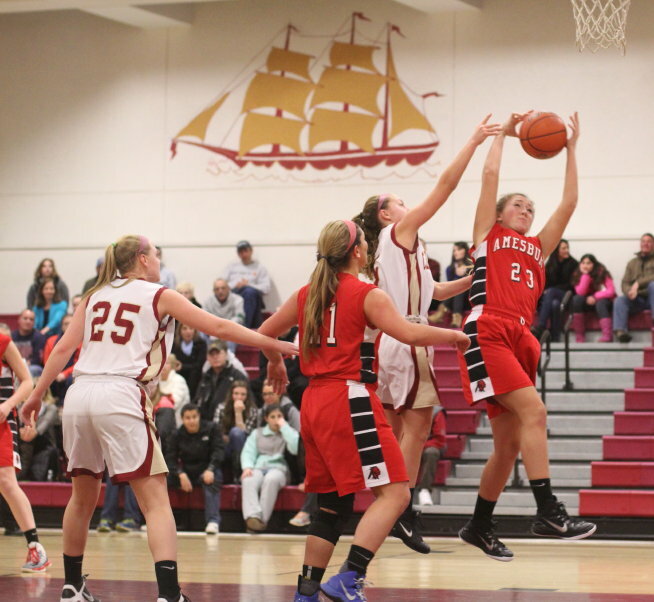 (Amesbury MA) Amesbury put runs of points together in both halves and defeated Newburyport, 53-35, on Friday night in Cape Ann League play. The win avenges an earlier loss to the Clippers. In the first half the Indians (6-5) put a 13-2 segment together to build up a ten-point league. In the second half the home team ran fourteen unanswered points and with it ended any curiosity about the final outcome. The Clippers (3-9) missed a ton of shots but credit the Amesbury defense for allowing very few uncontested shot attempts. 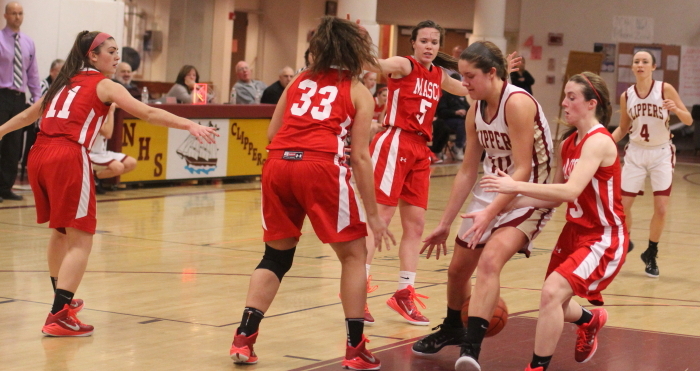 McKenzie Cloutier (12 points) led the AHS scorers getting ten of them in the second quarter. 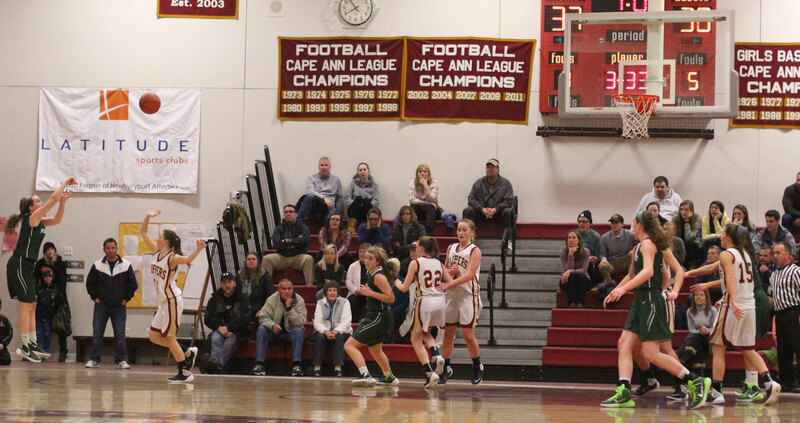 After Newburyport had moved to within seven points (17-10) in the second quarter on a driving layup by freshman Krysta Padellaro, McKenzie tallied three straight baskets to set up Amesbury with a, 23-10, halftime advantage. The Clippers finally were able to get some shots to fall in the third quarter. 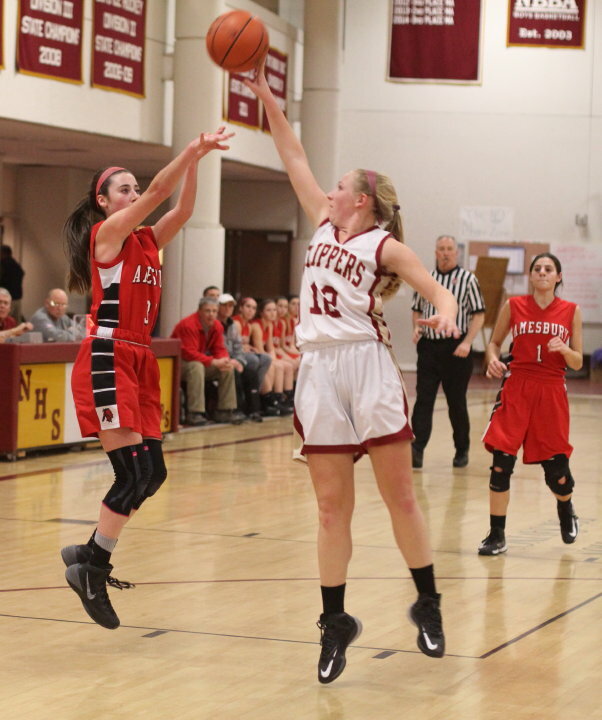 Krysta, Morgan Johnston (10 points), and Emily Pettigrew (13 points) combined for fifteen points for NHS in the first 4 1/2 minutes of the third quarter and the visitors were within ten, 35-25. 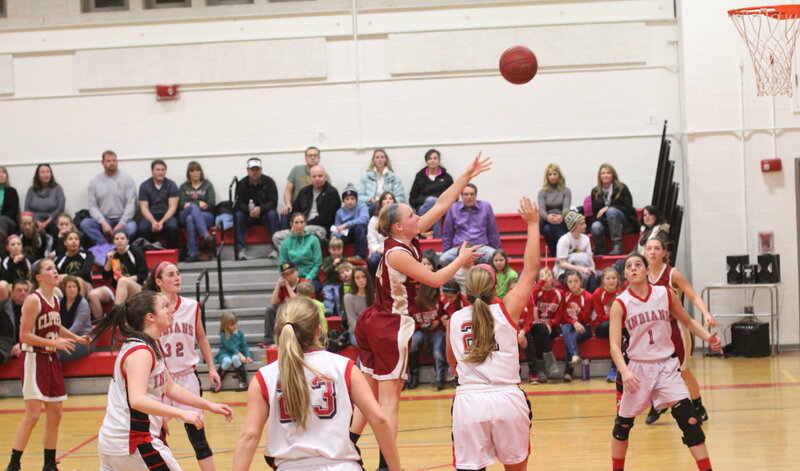 When Emily drained a three-pointer the Amesbury lead was sliced to seven. Plenty of game left for Newburyport to finish the comeback. 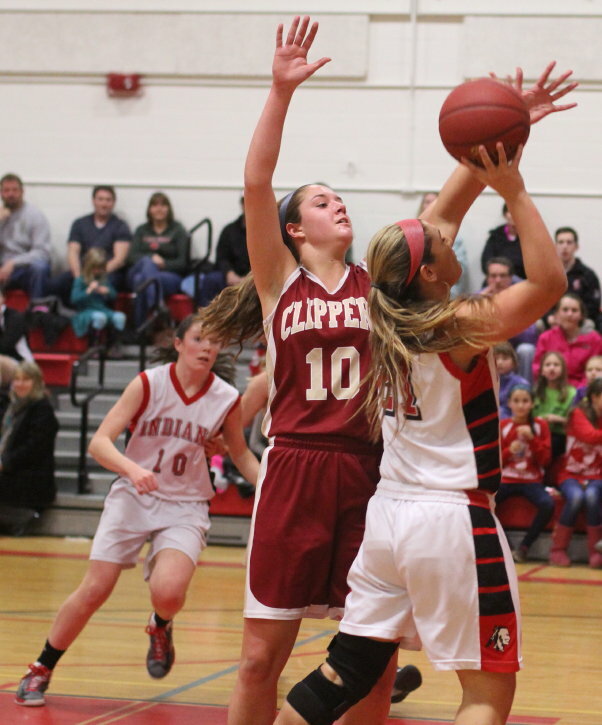 The Clippers hopes were further buoyed by word that Amanda Martin had fouled out with 2:18 left in that 3rd quarter. But rather than being in trouble, the Indians took their seven-point lead (35-28) and added fourteen straight points to it while holding Newburyport scoreless. 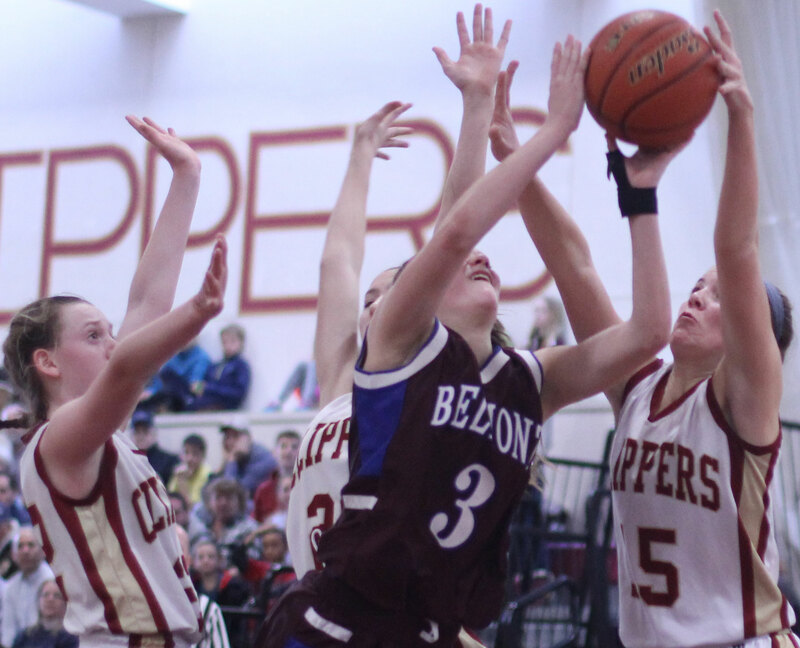 Shut out for 6+ minutes, the Clippers emerged from the dry spell down and out, 49-28, with four minutes left. Megan Reid, Julia LaMontagne, Abbie Sartori, McKenzie Cloutier, and Zoe Fitzgerald scored points in the game-deciding Amesbury streak. 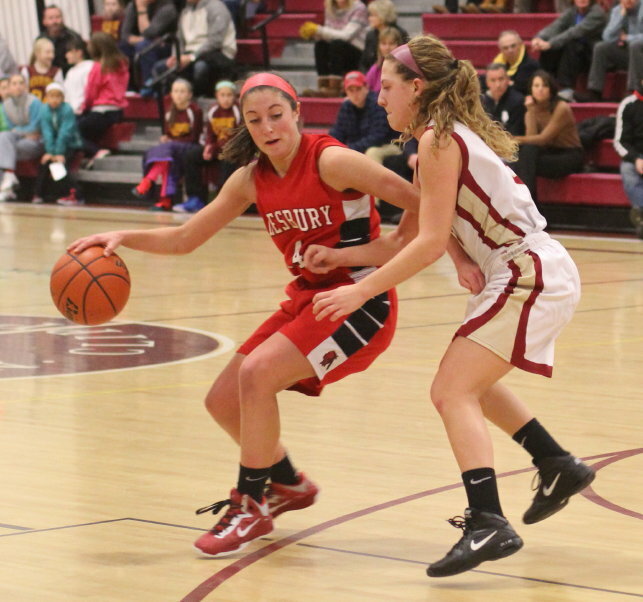 Junior Megan Reid finished with eleven points for Amesbury. 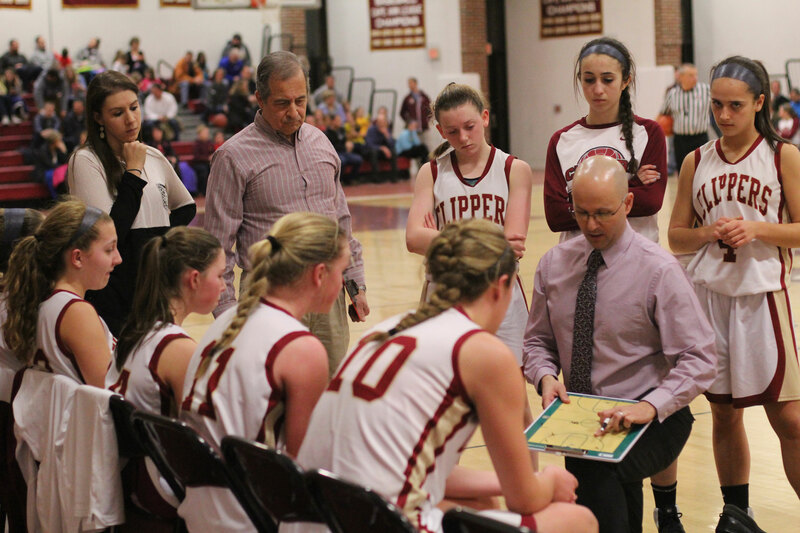 Newburyport has now lost four of their last five games. Amesbury has won three of four. 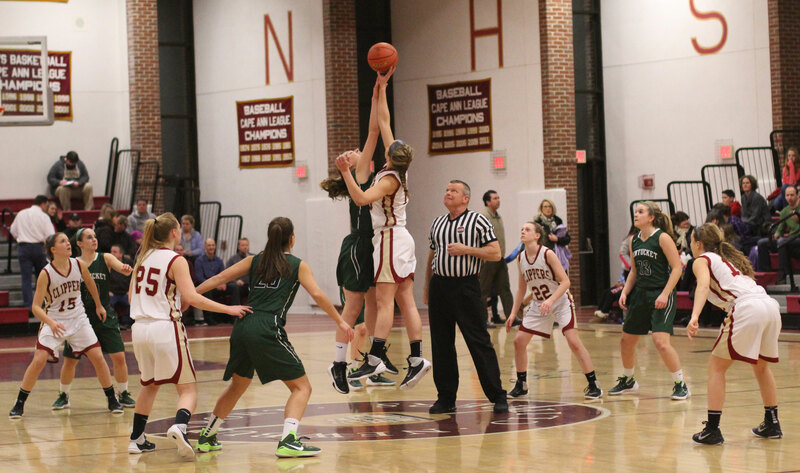 Newburyport won the first meeting between the two teams, 50-48, on January 5th. Olivia Olson had twenty points in that one. This time around the AHS defense held Olivia to a quiet two points. 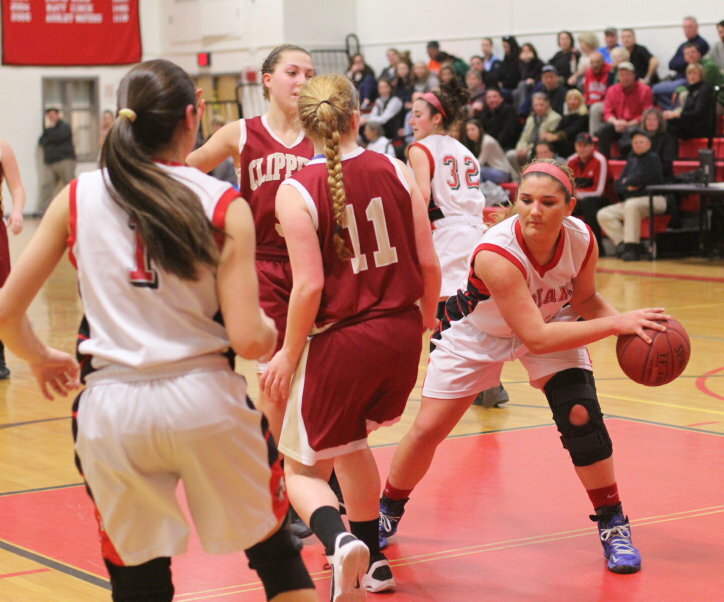 The Indians won despite little playing time for Cape Ann League All-Star Amanda Martin. 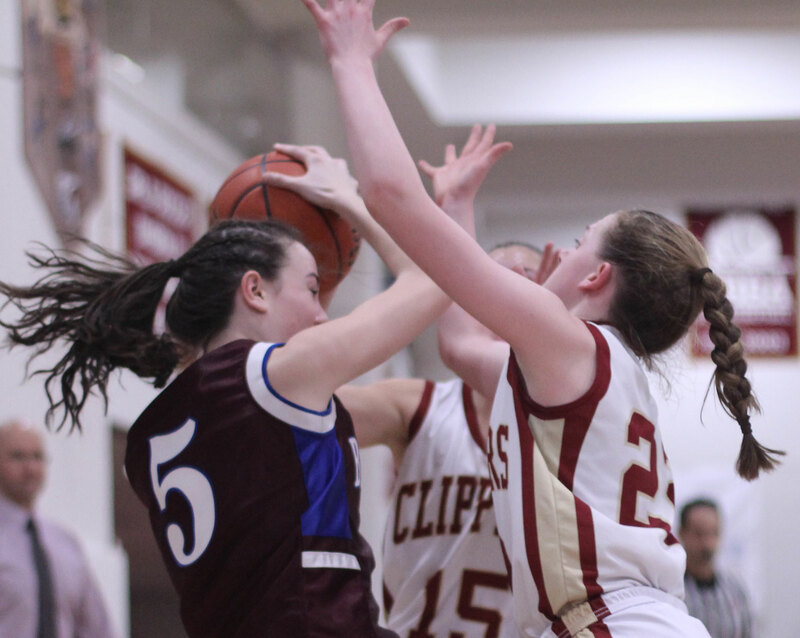 Amanda was a foul-magnet from the very outset getting two fouls in the first forty-nine seconds. She picked up a 3rd in the second quarter and in the third quarter two more. 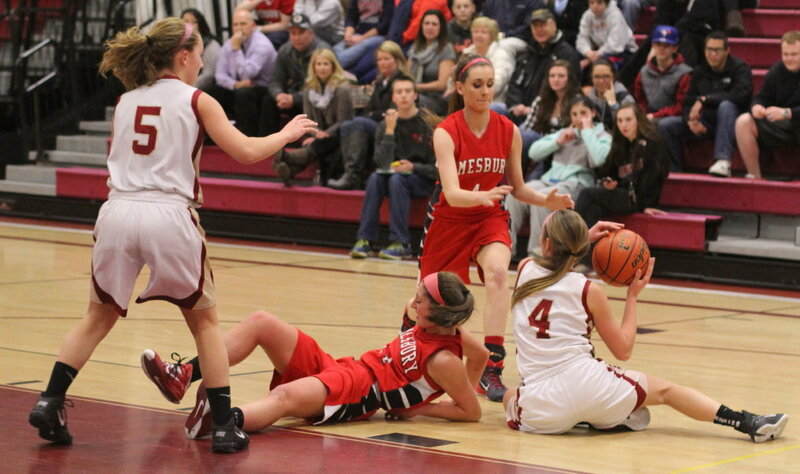 The 5th one came on an Amesbury 2-on-1 fastbreak and didn’t sit well with the Amesbury faithful. But on this evening it didn’t matter because the Indians had tight defense no matter who was playing and shots were falling for their team. 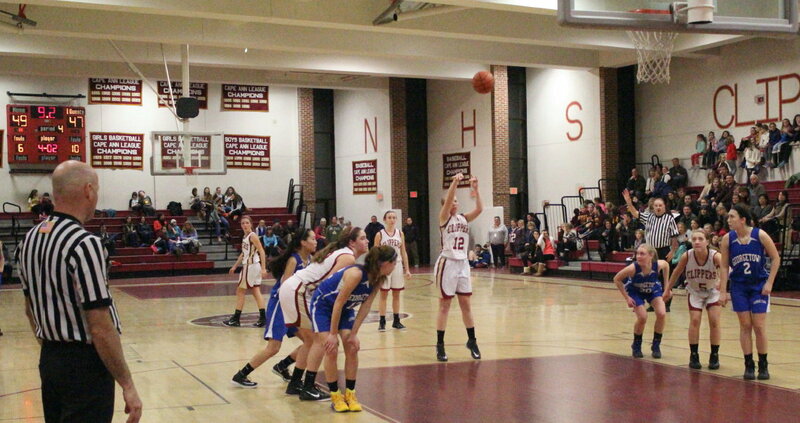 The free throw shooting wasn’t very good in this game: Amesbury (11-for-19) and Newburyport (4-for-13). Both teams resume play on Tuesday. Newburyport hosts Lynnfield while Amesbury visits Triton. Tessa Lafrance and Erin Savage from the Triton team were in the house tonight. 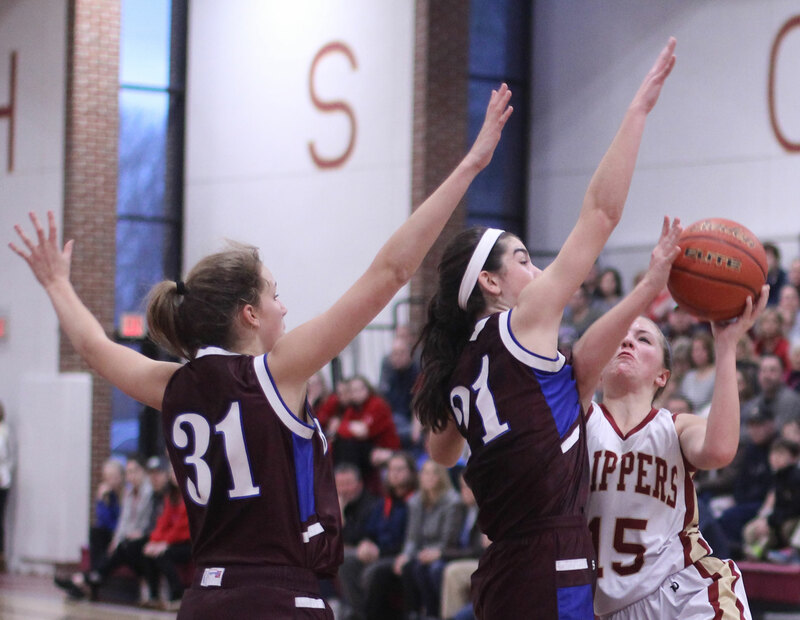 (Newburyport MA) Newburyport (3-8) made four straight free throws in the final twenty-six seconds to defeat Georgetown, 50-47, on Friday night in Cape Ann League action. 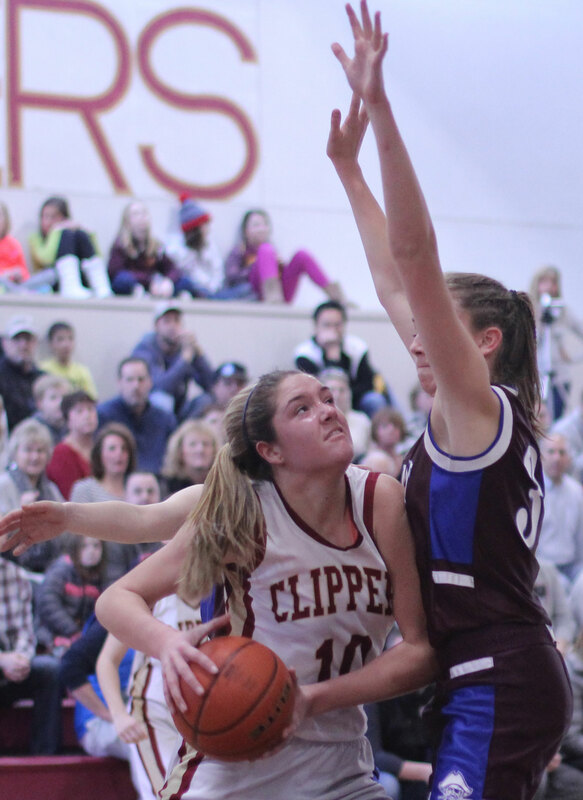 Morgan Johnston (21 points) led the Clippers’ inside approach that accounted for every field goal except Kaitlin Ahern’s jumper in the second quarter. I don’t recall NHS even attempting a 3-pointer. Georgetown, on the other hand, was willing to fire from long-range on every opportunity. 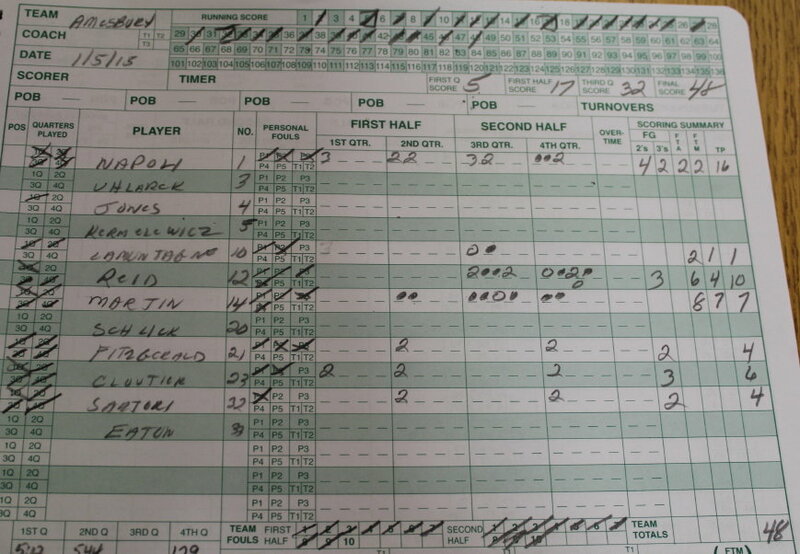 They connected nine times from beyond the arc including two times in the final thirty-two seconds. 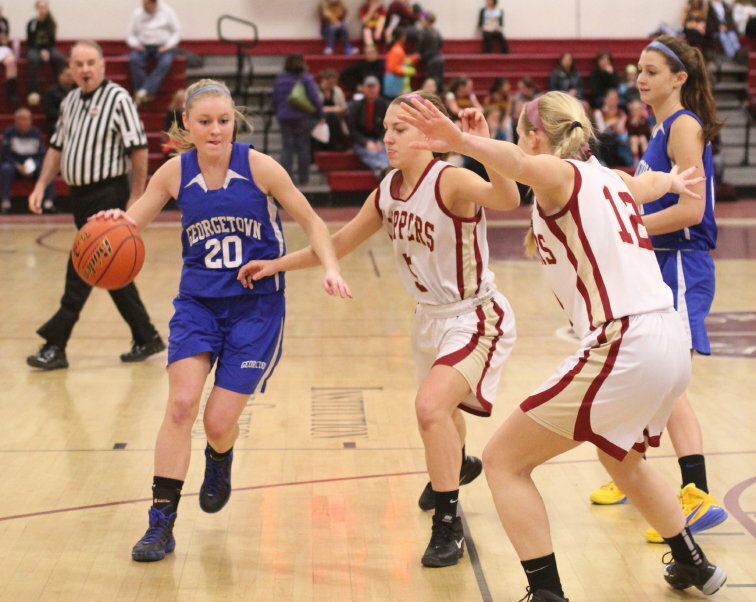 The Royals Cayla Durkee missed a game-tying three with a second left. Five different G’town players had 3-pointers. Junior Maya Spence (17 points) clicked from downtown three times. The Clippers got off to a terrific start (10-0) and later late in the third quarter had a comfortable, 41-28, advantage. But Cayla Durkee and Maya Spence hit three’s in the final minute of the third quarter to give the visitors some life going into the last quarter. Georgetown (5-5) turned up the defensive heat in the final quarter and things started getting real interesting. Twelve turnovers (that is not a misprint!) 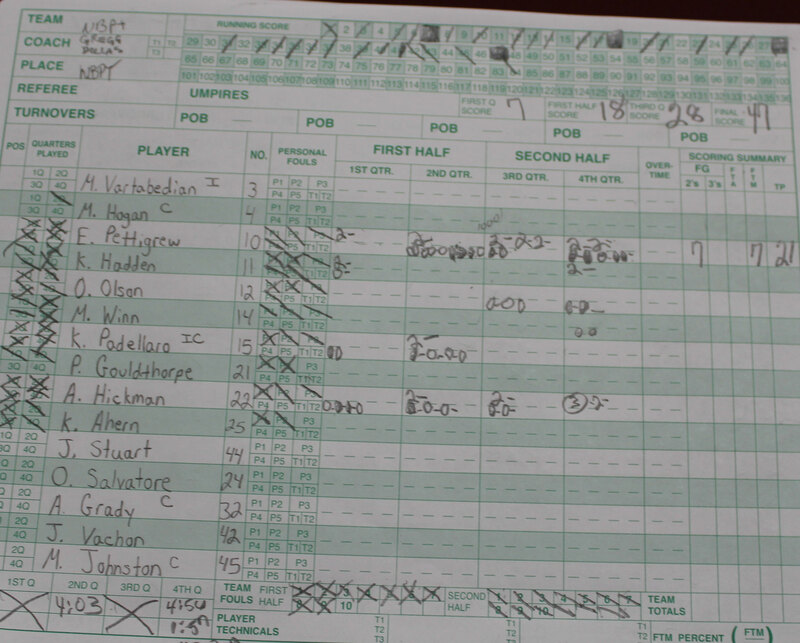 later the Newburyport lead was just two (46-44) after Rory Donoghue nailed a three with thirty-two seconds left. At this point, the Clippers had struggled mightily at the free throw line making only 8-of-22. It made perfect sense for Georgetown to foul. They did and sent Emily Pettigrew to the line. Emily had missed three of her last four attempts but with twenty-six seconds left made two straight. Newburyport now up by four (48-44). 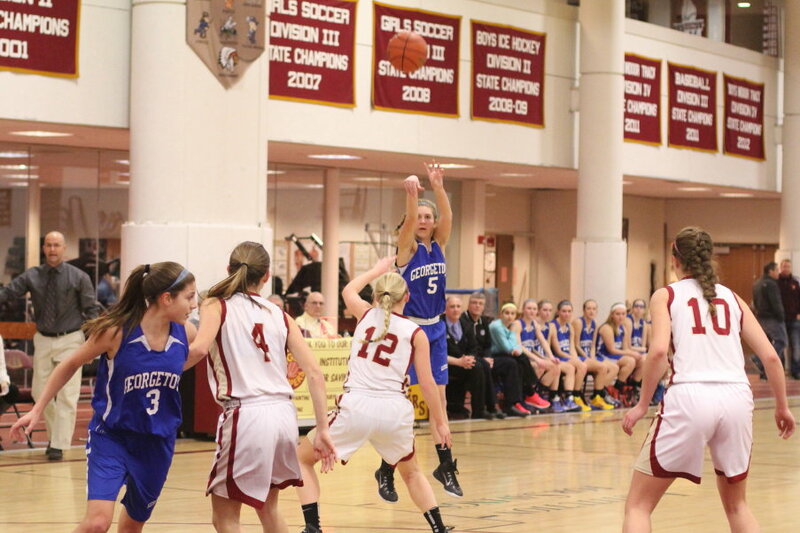 The Royals went looking for a three and found one from Isabel Block with thirteen second remaining. Georgetown within one (48-47). 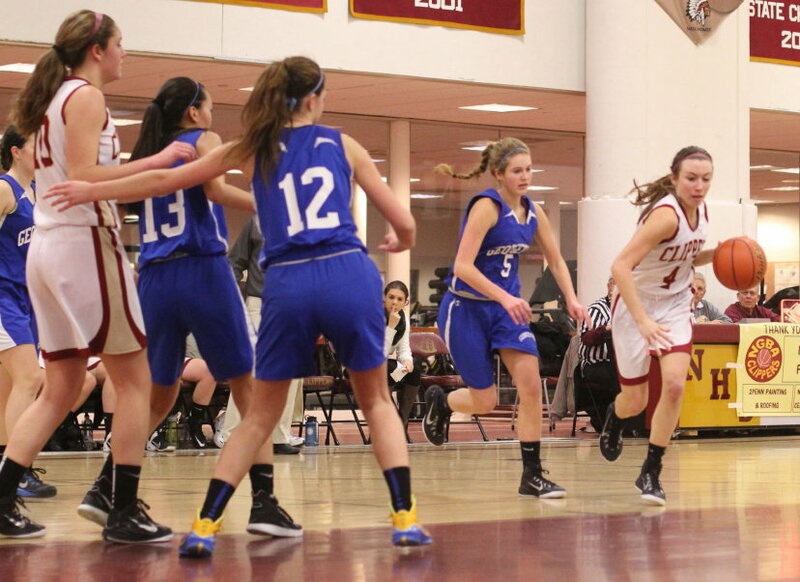 Newburyport inbounded the ball successfully to Emily Pettigrew. 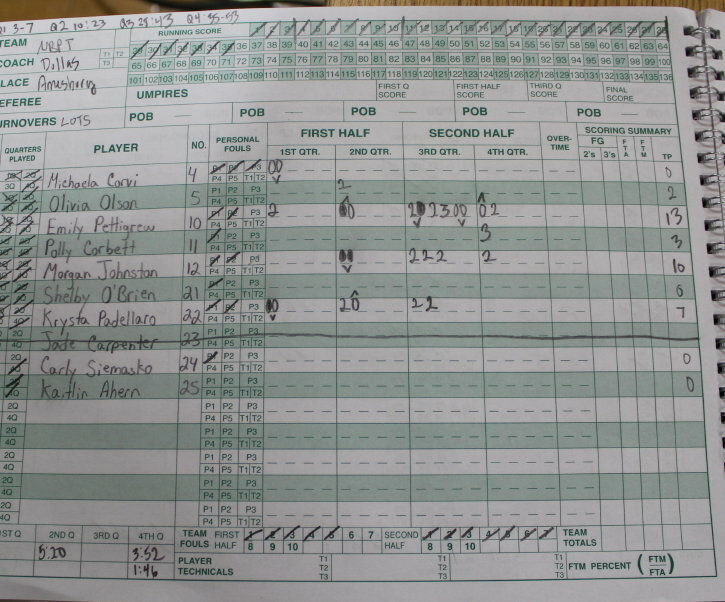 Inbounding was not a sure thing with twelve NHS turnovers already committed in the quarter. 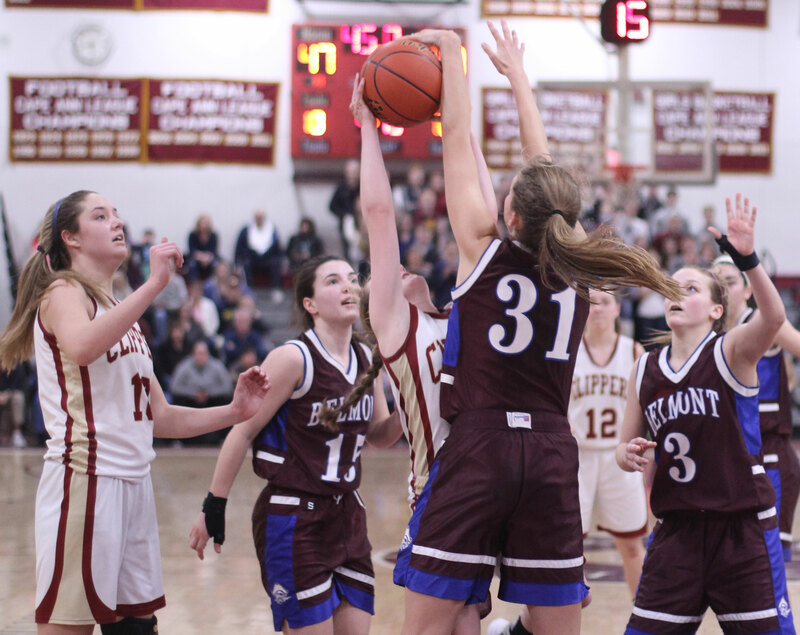 I am quite sure Newburyport coach Gregg Dollas wanted Emily shooting foul shots in a one-point game but she passed the ball back to Morgan Johnston. Morgan was quickly fouled. Morgan had missed five of her last six free throws but in a one-point game with nine seconds left she swished both attempts. 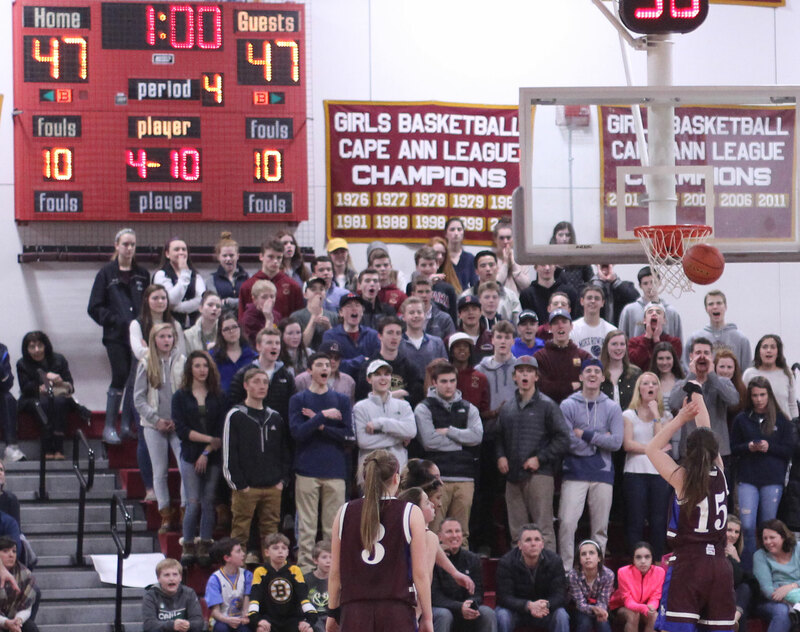 Those make’s gave Newburyport a three-point lead that held up when G’town’s final shot missed. The Clippers ended a three-game losing streak. They will resume playing next Friday at Amesbury. A likely reason for Georgetown’s poor start was losing starter Rory Donoghue after less than two minutes with two fouls. 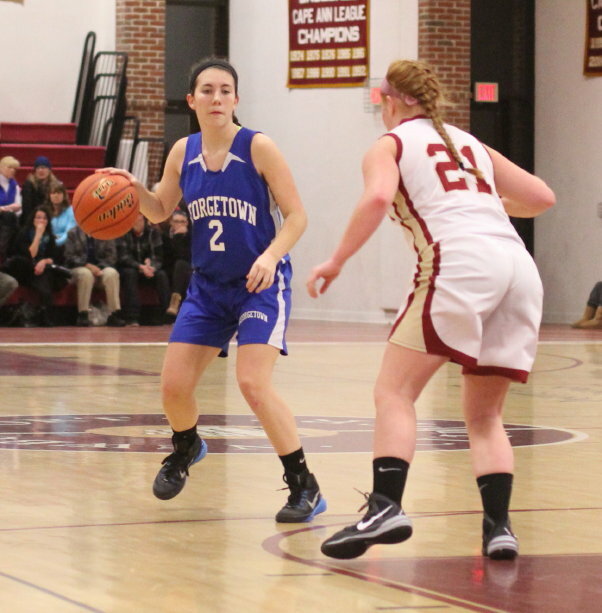 Rory had fifteen points and sixteen rebounds in the G’town win over Hamilton-Wenham. Morgan Johnston set up close to the basket and was able to spin either way to get high-percentage shots. Emily Pettigrew stayed away from the basket and that gave Morgan room to operate. Most of Morgan’s baskets were assisted baskets. 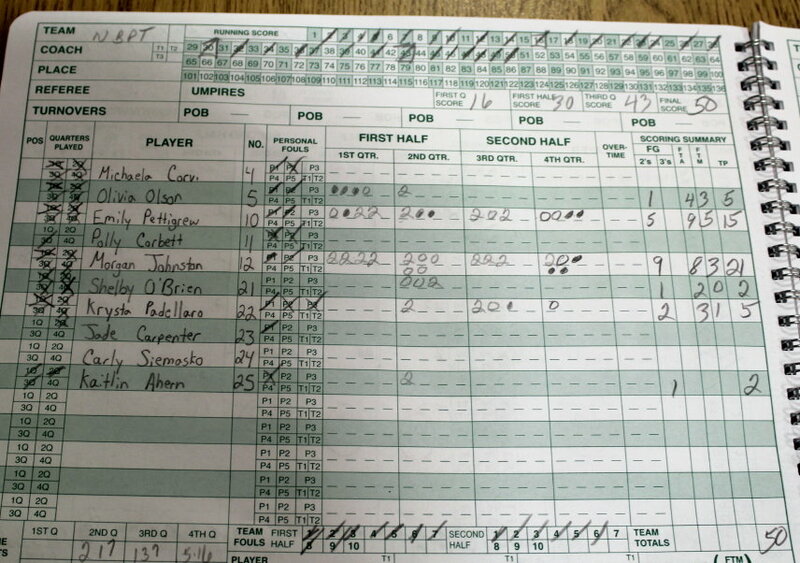 Morgan scored the first basket in every quarter and the last two points of the game. Emily Pettigrew had fifteen points for NHS. Kayla Durkee added ten for the Royals. The 12 turnovers by the Clippers in the final quarter were a big surprise after they had only three miscues in the entire first half. 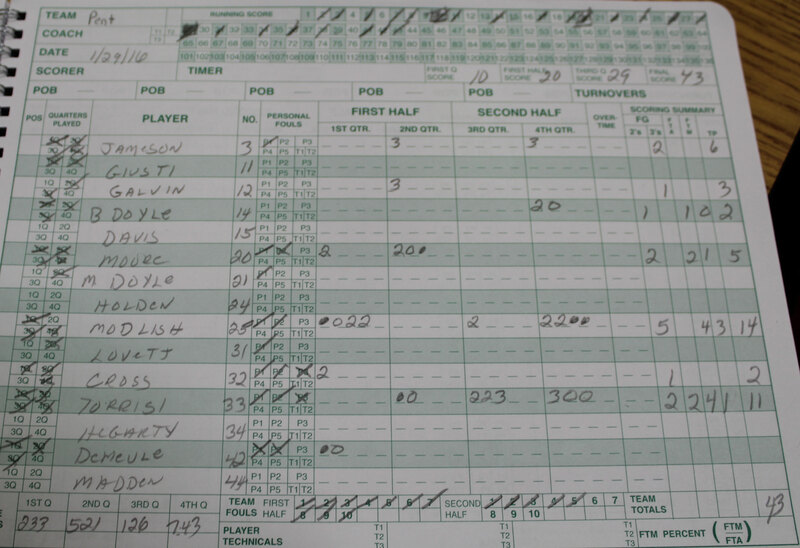 Georgetown was 6-of-13 from the foul line. 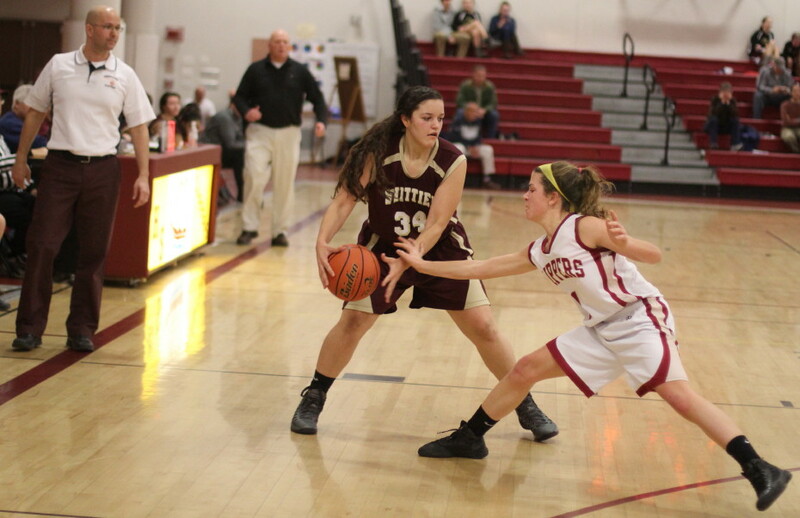 Newburyport scored the first ten points in the first half and the first seven points in the second half. Georgetown never led but did tie the score, 26-26, on a three (Maya Spence) in the last minute of the first half. The Royals’ next game is Sunday (10AM) at Saugus. 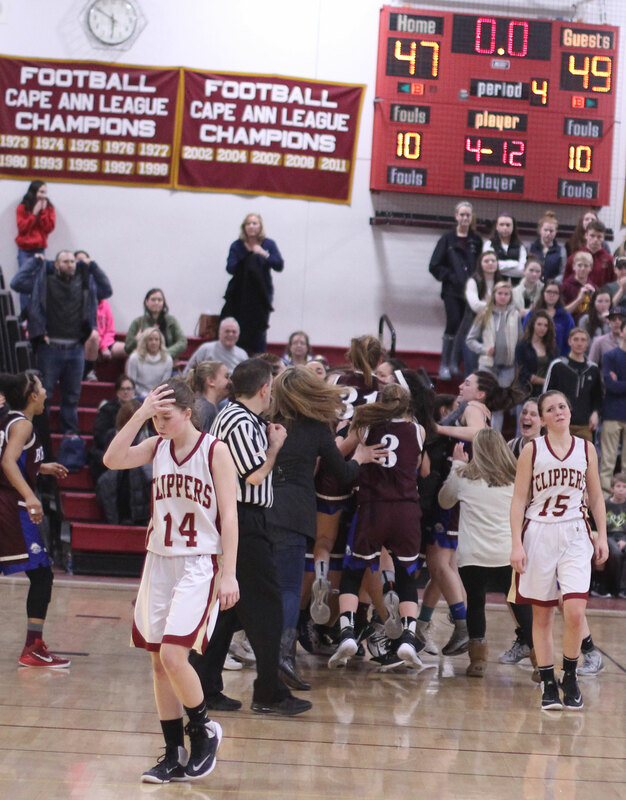 (Newburyport MA) It was one of those nights for Newburyport sophomore Olivia Olson. 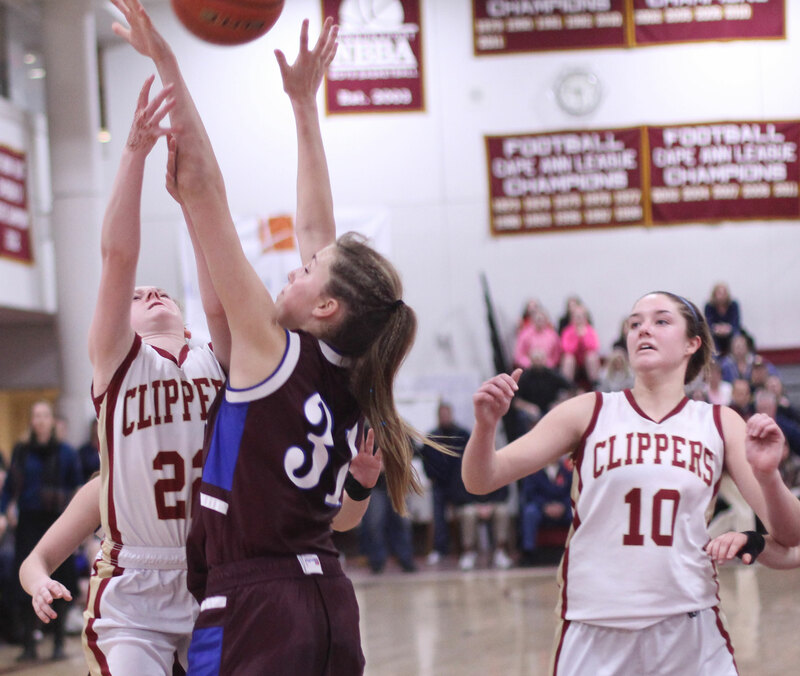 Olivia paced the Clippers (2-5) with twenty points but her biggest shot of the night was a complete miss that set up the game-winner in Newburyport’s 50-48, win over Amesbury on Monday night. 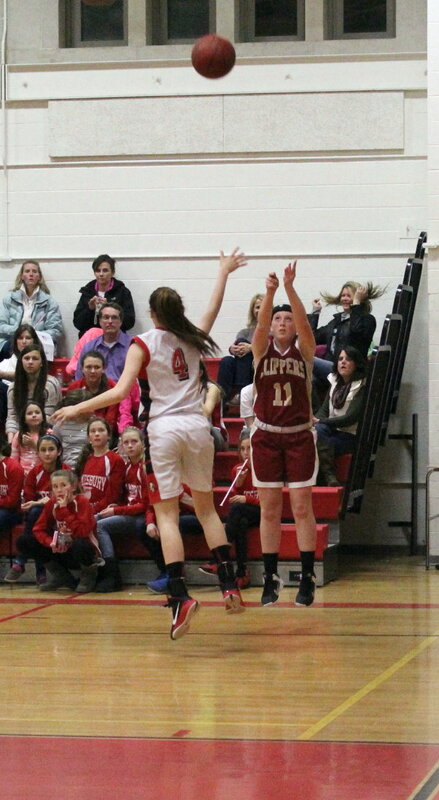 Olivia’s late-in-the-game launch was undershot but came right to teammate Emily Pettigrew (11 points) under the basket. Emily, who struggled all game to get open, was wide open on this occasion and cashed the last-second layup to seal the deal for the Clippers. 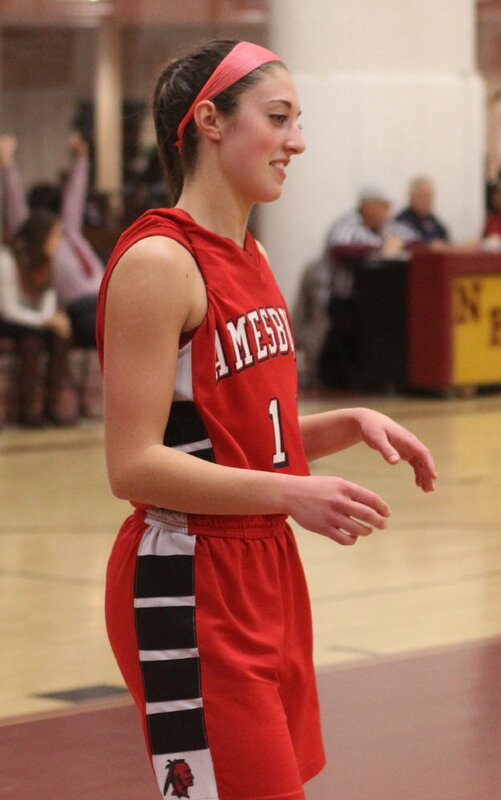 Amesbury (3-3) had rallied in the last minute on inside scores by Abbie Sartori and McKenzie Cloutier to knot things at 48-48 before Newburyport’s last-second heart breaker. The Indians were down by as many as eight (23-15) in the first half but miscues by the Clippers in the 3rd quarter (eight turnovers) opened the comeback door for the visitors. 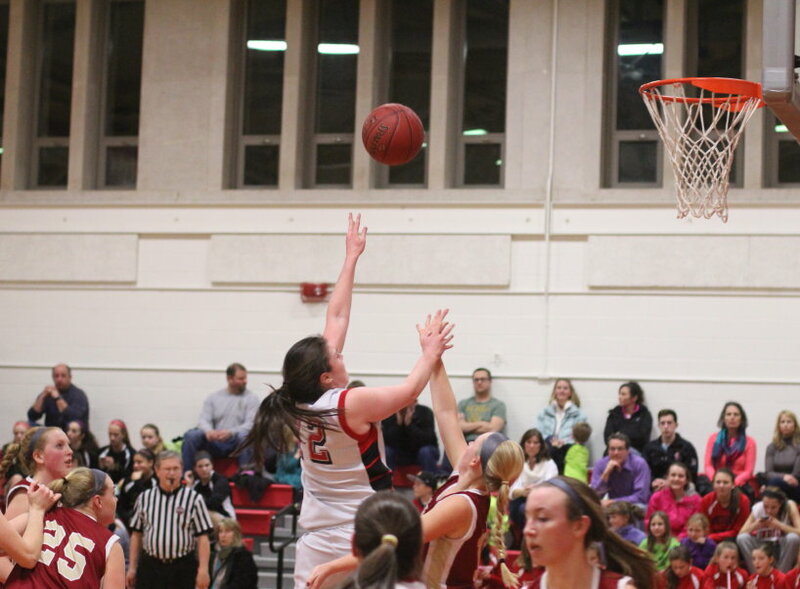 Maddie Napoli’s fall-away 3-pointer put Amesbury ahead, 30-28, with 2 1/2 minutes left in the quarter. 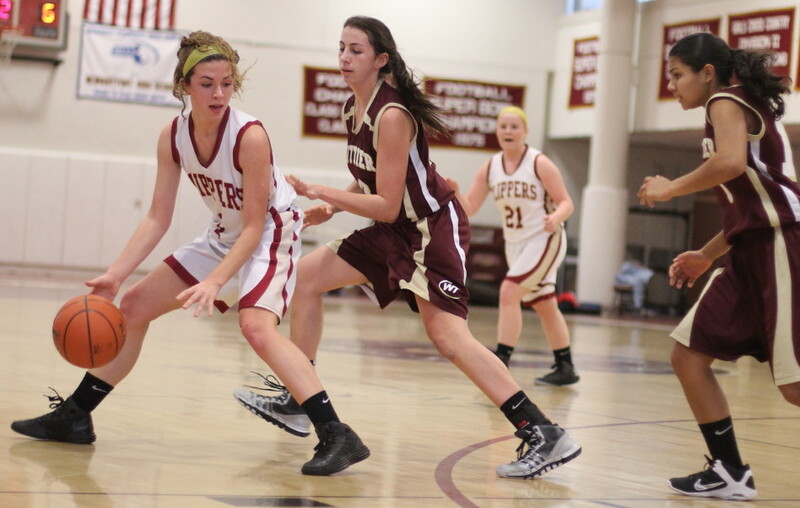 Newburyport (2-5) responded with seven unanswered points. 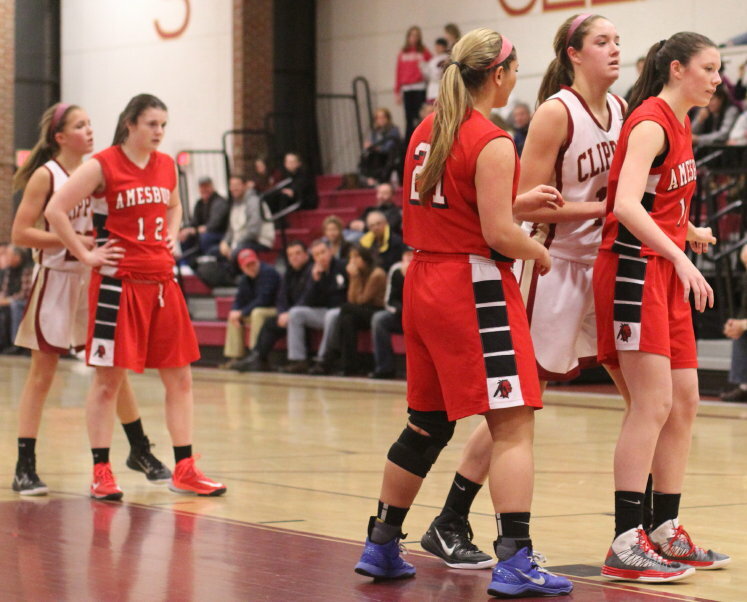 Amesbury tied the score at 43 (converted rebound by Megan Reid) and later at 48 with seventeen seconds left. Olivia Olson hit five 3’s getting at least one in each quarter. 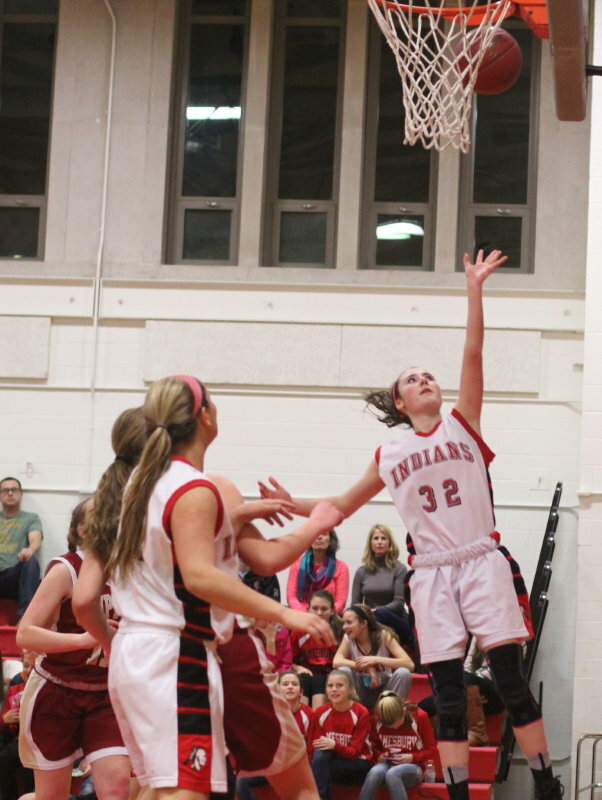 Her work defending the Indians’ top scorer Amanda Martin was also noteworthy. 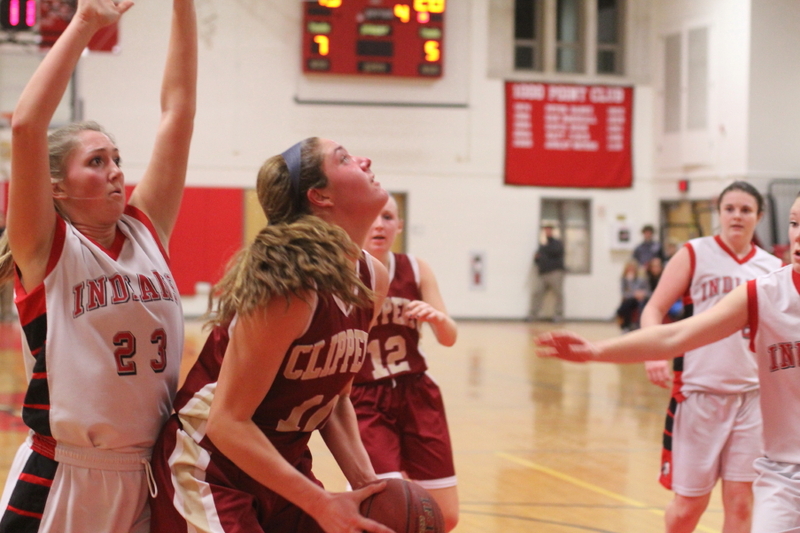 Olivia limited the Cape Ann League second-teamer to seven free throws. Amanda did miss a number of minutes in the second half because of foul trouble. The Indians’ zone defense was very effective in keeping the ball away from 6′ Emily Pettigrew (CAL first team). 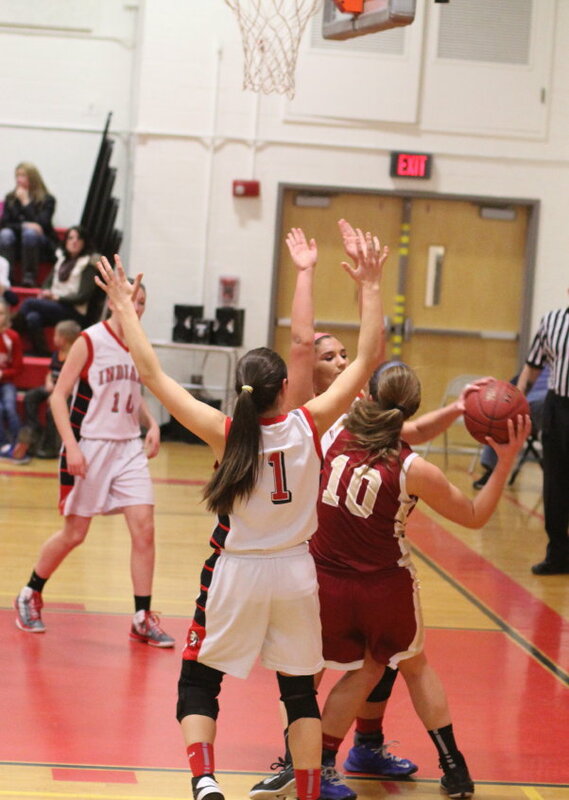 Amesbury’s concentration on the inside opened opportunities on the outside and on this night Olivia Olson took full advantage. Emily’s layin in the last second won the game but she also had a three from the right corner (set up by Michaela Corvi) that put NHS in front by four with 1 1/2 minutes to go. 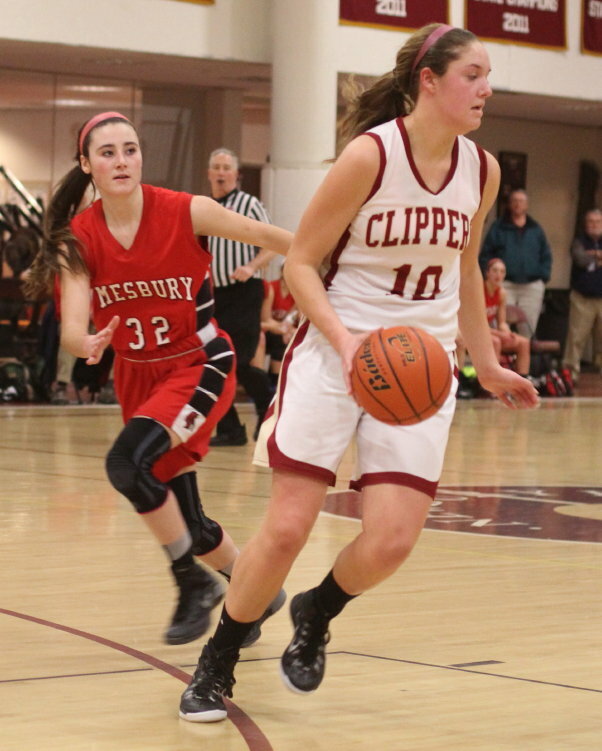 Newburyport missed eight free throws (10-for-18) while Amesbury missed only four (14-18). 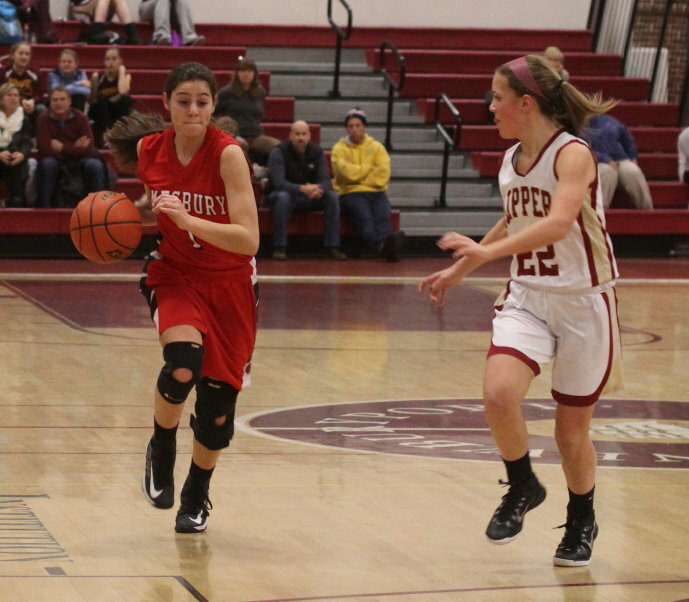 Sophomore Maddie Napoli (16 points) impressed at point guard for Amesbury. The Indians had only five turnovers in the second half. 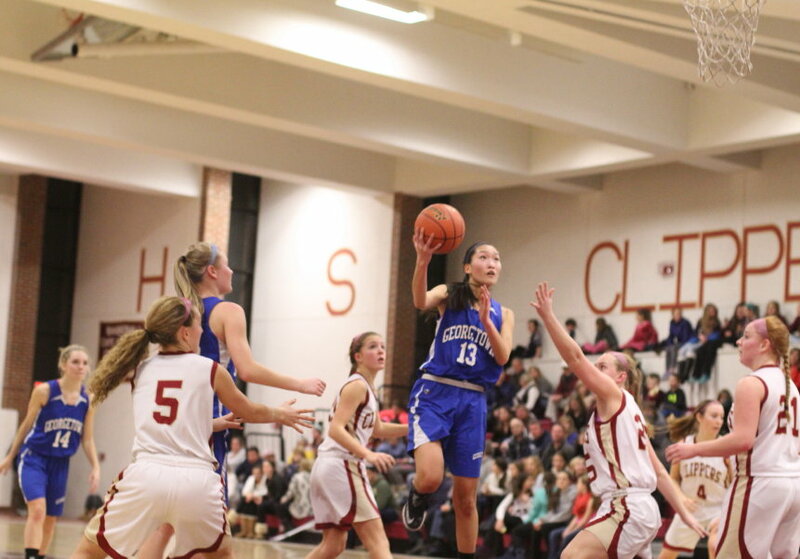 Maddie hit two 3’s and made several difficult layups in the lane. Newburyport travels to Everett on Wednesday night. Next for Amesbury is an away game versus Pentucket on Friday night. 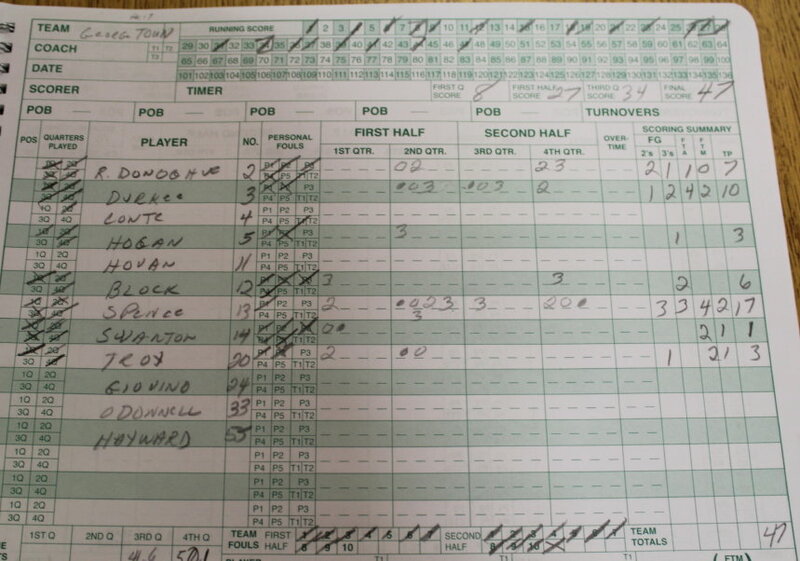 No one seemed to know when the last time was that Amesbury defeated Newburyport. Believe me; they nearly pulled it off in this game! 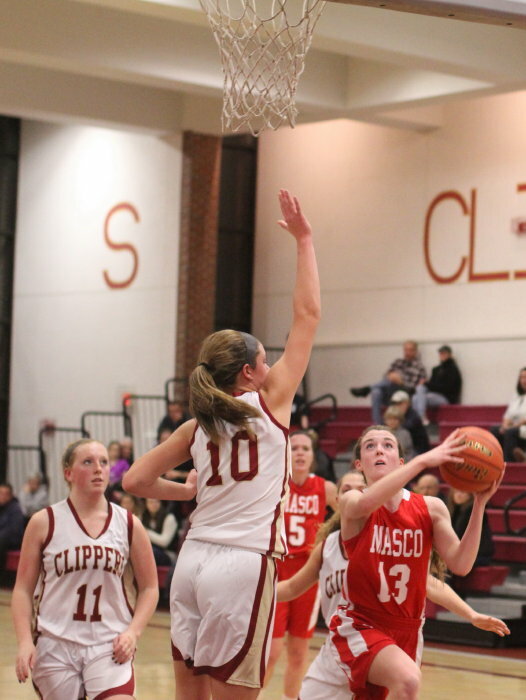 (Newburyport MA) Masconomet ran away from Newburyport in the second half and defeated the Clippers, 59-33, on Friday night in Cape Ann League play. 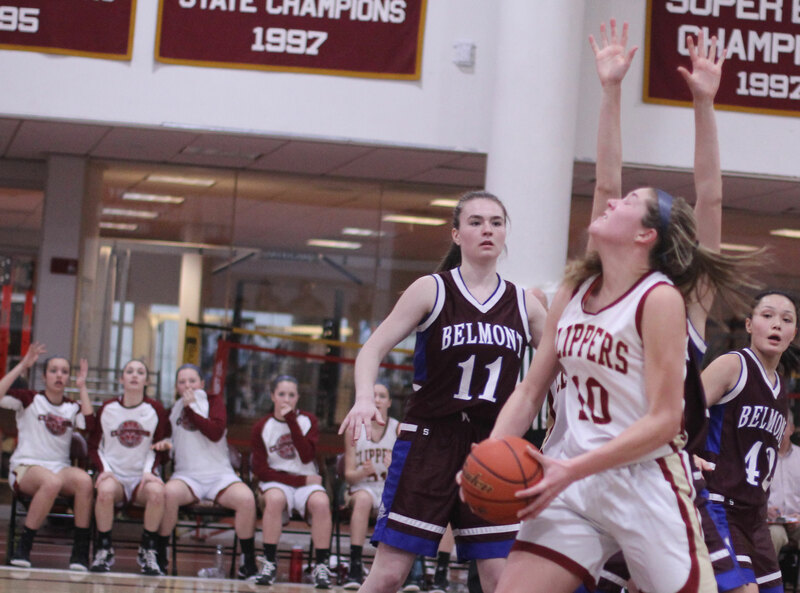 The Newburyport (0-2) deficit was only six (22-16) after junior Emily Pettigrew (16 points) broke free thanks to a nice pass by Shelby O’Brien early in the third quarter. However, consecutive three’s by senior Lauren Sorel (13 points) sent the Lady Chieftains off on a 24-6 run that stretched into the final quarter. 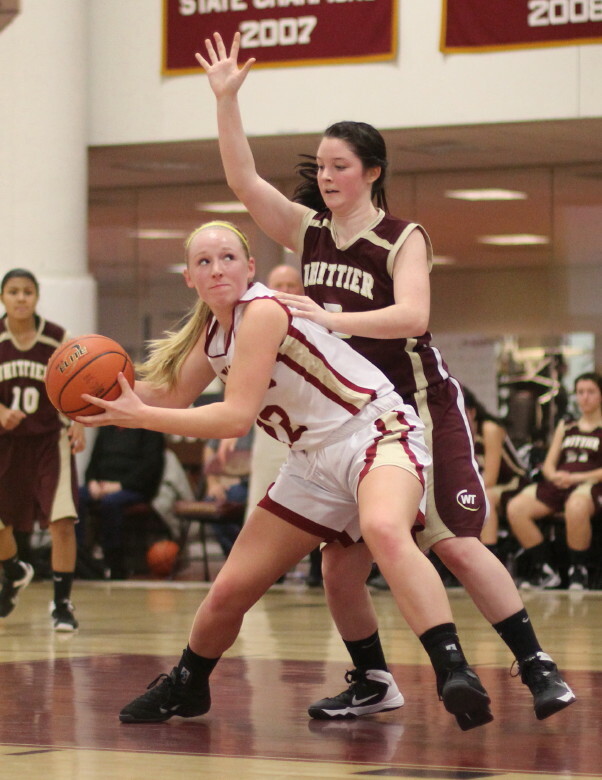 Senior Meghan Collins (18 points) added nine points in the breakaway segment. 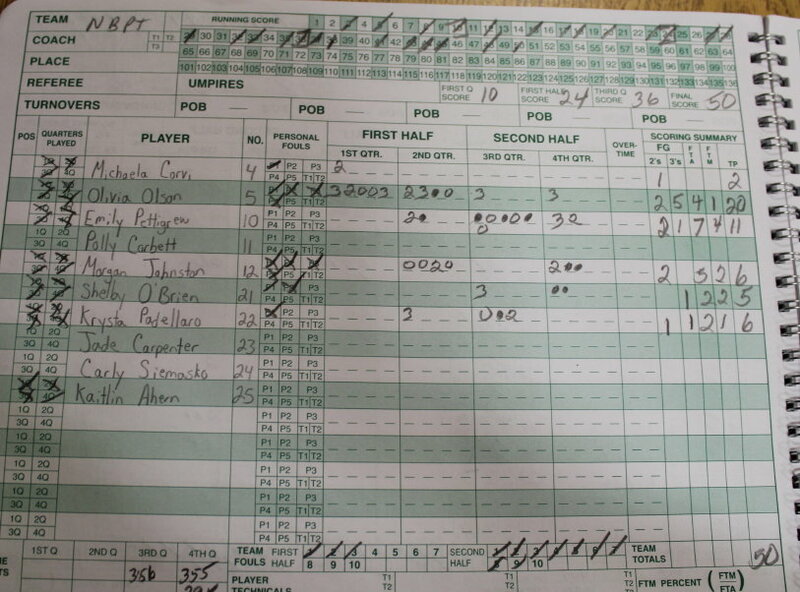 Newburyport was hurt badly by turnovers……twenty-two by my count. At least half of the TO’s were unforced. 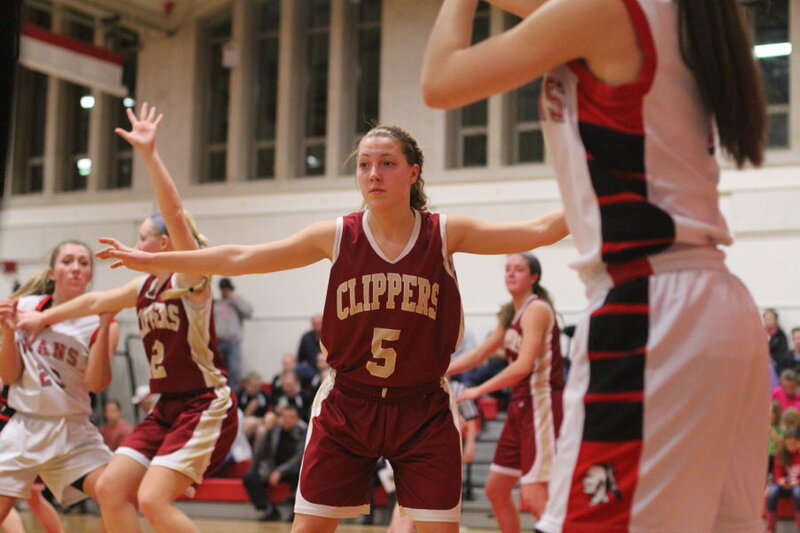 The Clippers wanted to get Emily Pettigrew (6′) as many touches as possible. 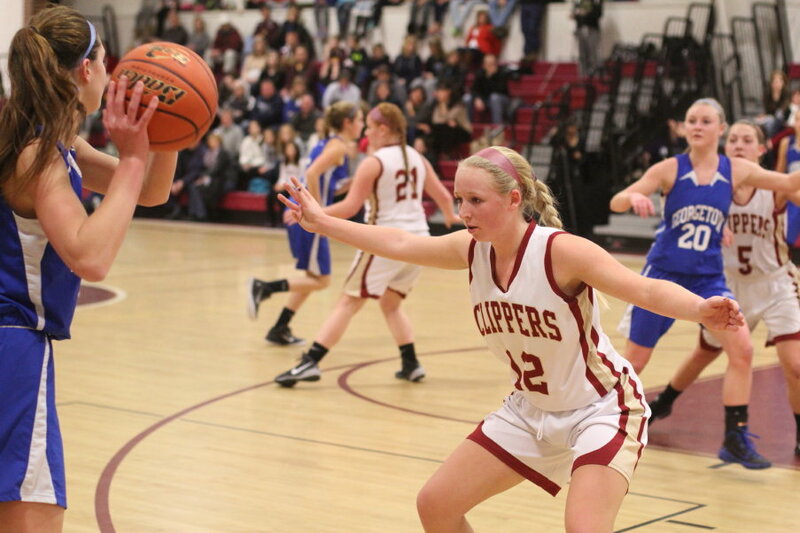 Emily had 24 points in the Clippers opening game loss to North Reading. 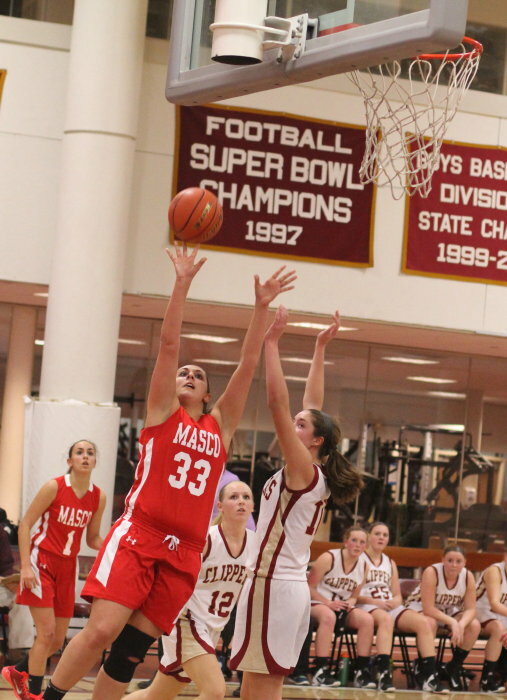 Masco’s Kate Kitsakos (16 points) covered Emily tightly and, despite giving away five inches, made passes inside difficult. 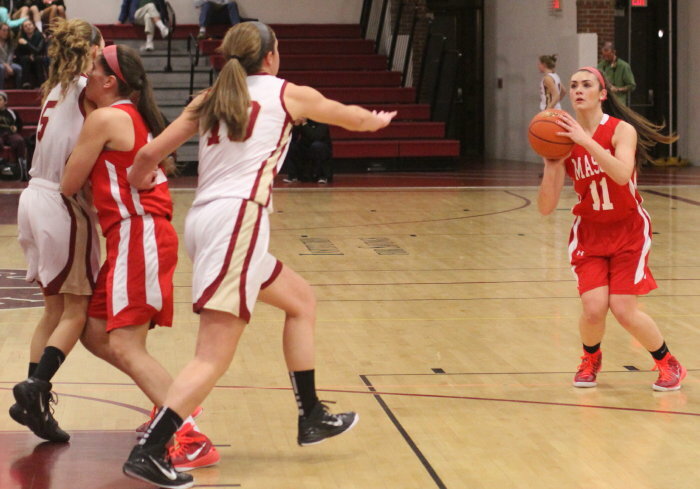 Meghan Collins (First team CAL All-Star last year) had a terrific second half for Masco. 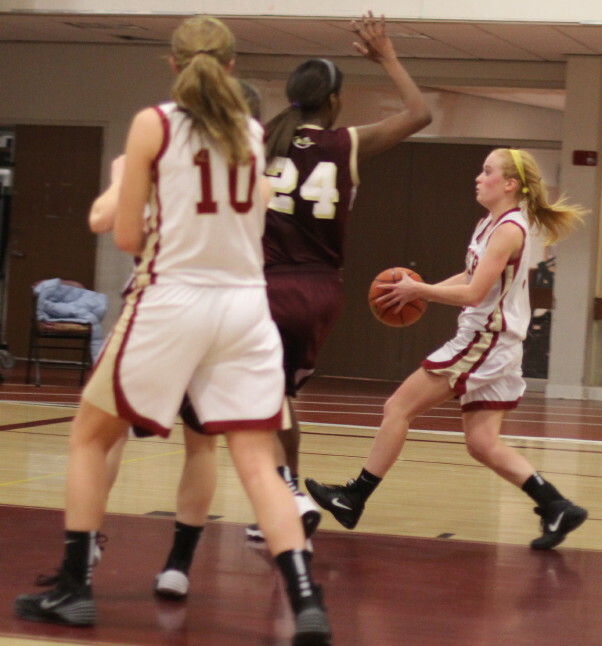 Meghan had twelve points in the final quarter hitting from long range and driving to the basket. The 5-7 senior guard also collected twelve rebounds for the Lady Chieftains. Neither team played very well in the first half. 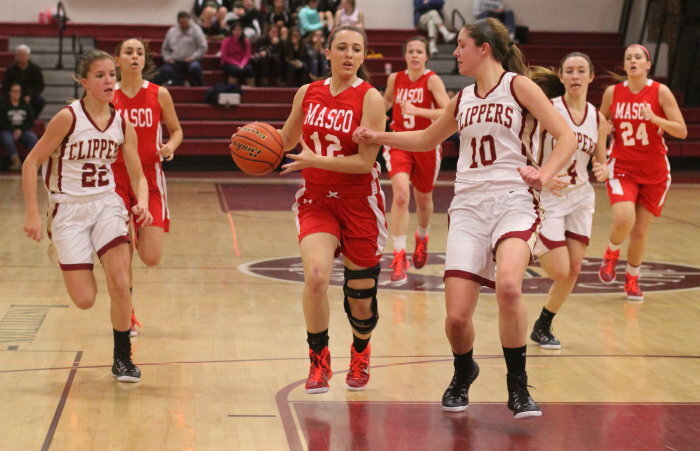 Masco (1-1) led 18-13 but had eight turnovers. The Clippers had eight turnovers in just the first quarter and struggled to run offense that would turn up high-percentage shots. 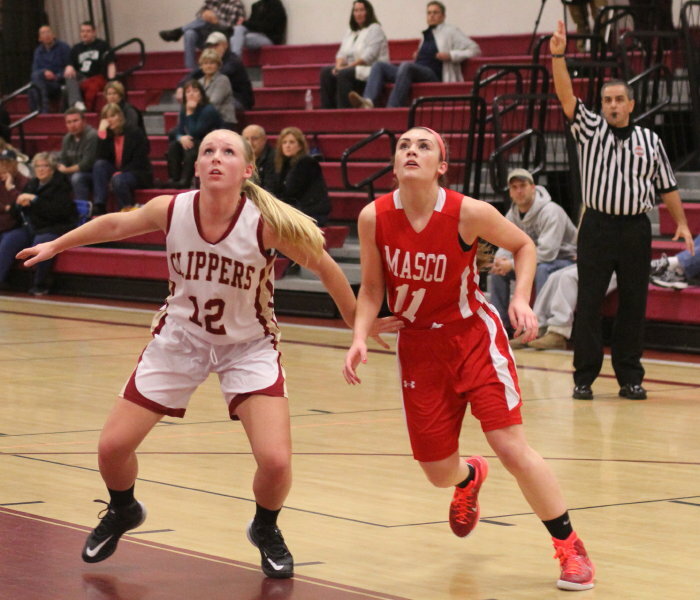 Masco continued with the solid man-to-man defense in the second half and when their shots started falling the Clippers were doomed. Masco’s good outside shooting forced the home team to expand their defense opening up drives to the basket for the visitors. Meghan Collins and Kate Kitsakos were quick to take advantage. 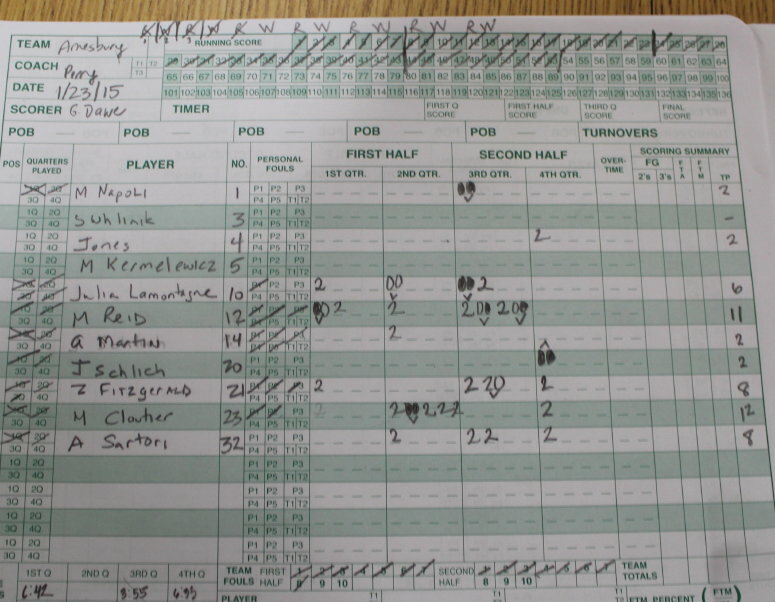 The Lady Chieftains ended up with twenty-eight points in the paint. 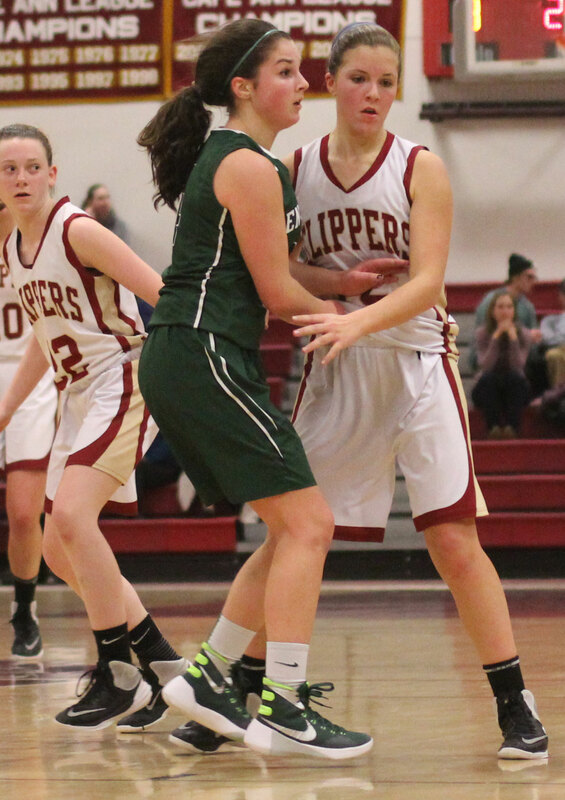 Meghan Collins found foul trouble in Masco’s loss in their opener to Pentucket but not this time. 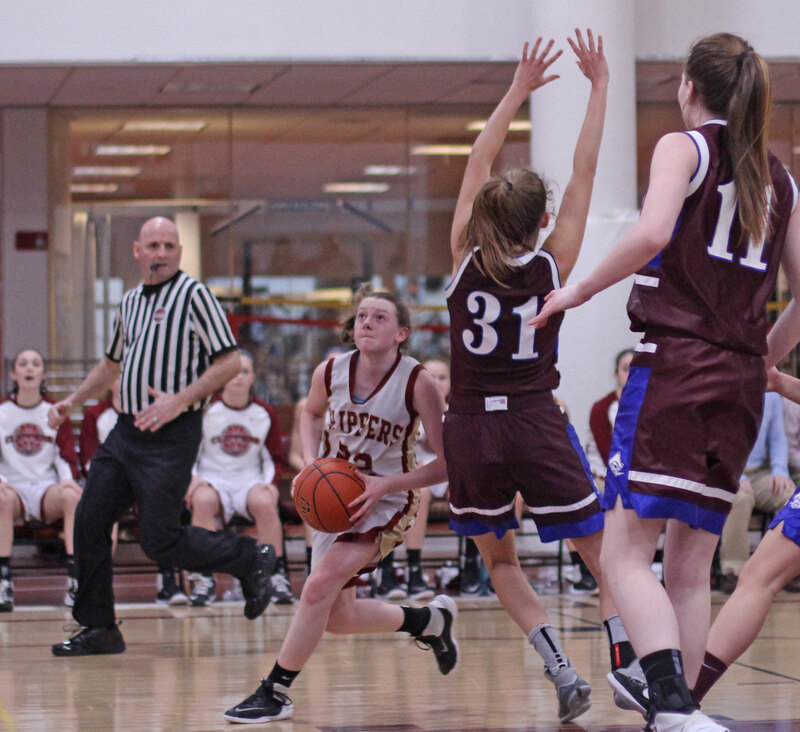 Teammate Stephanie Mini had three fouls in the first half versus Newburyport and saw her playing time limited as a result. Both teams were underwhelming at the free throw line. 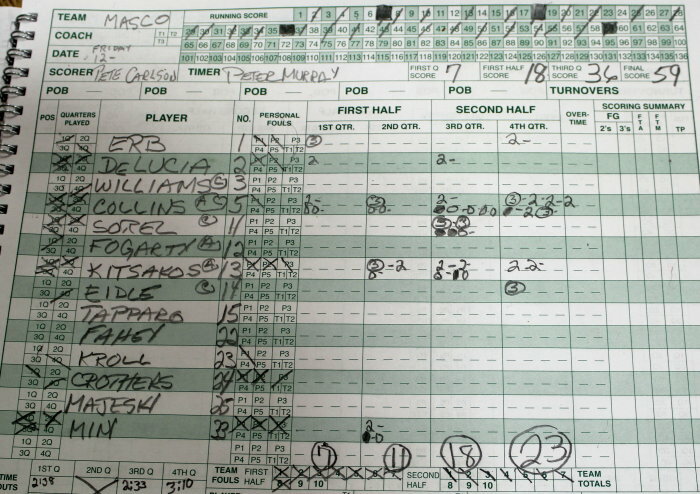 NHS was 9-for-19 while Masco was 6-for-16. 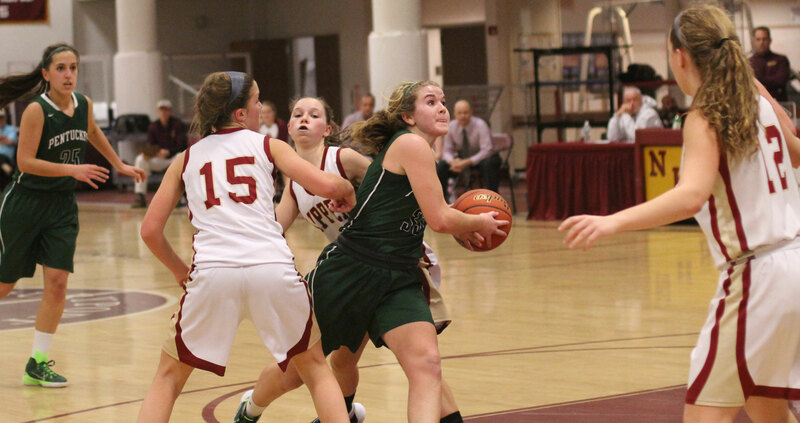 Lauren Sorel clicked three times from long range against Pentucket and Newburyport. Someone better start yelling, “Shooter!” when she gets the ball. 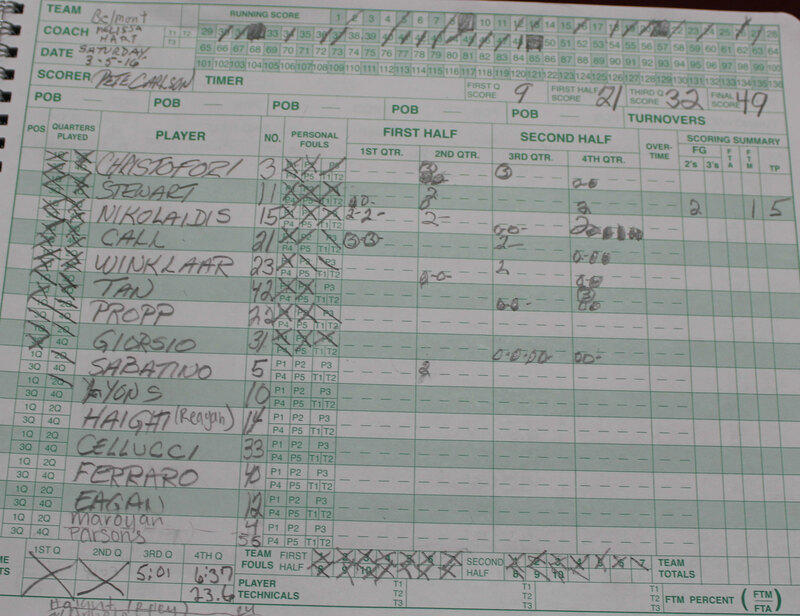 Thanks to Andy Tapparo, who runs the Masco Girls Basketball website, for help with statistics. 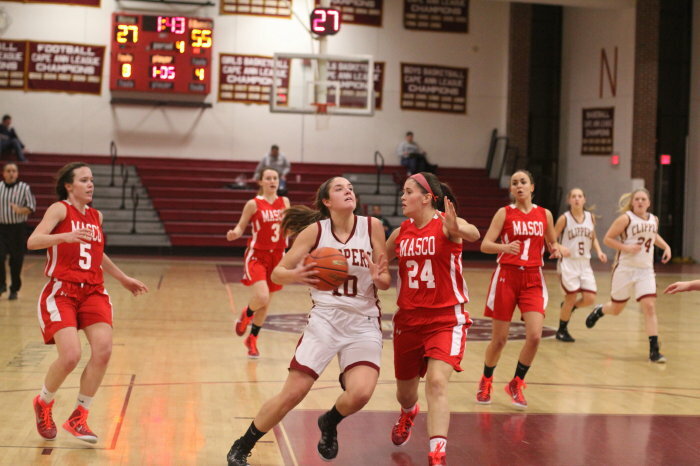 Next game for Masco is home on Monday against Triton. 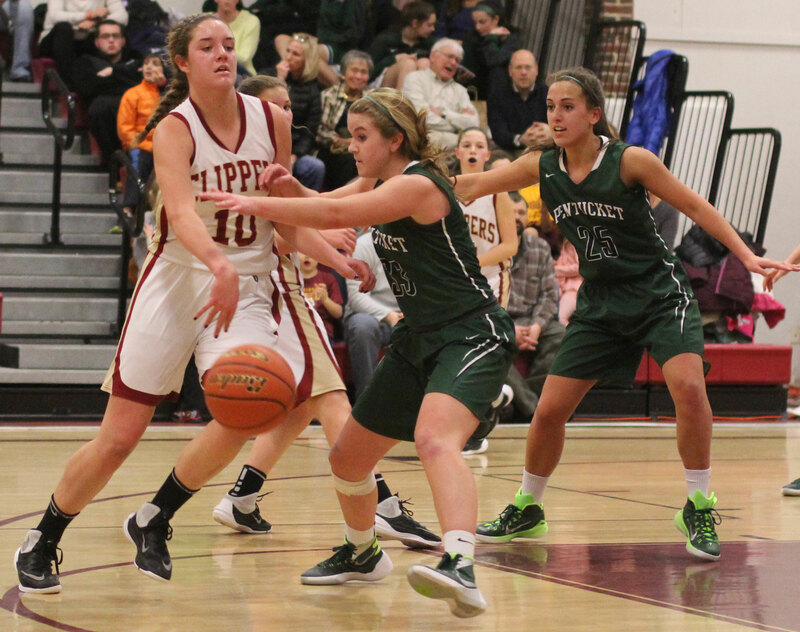 Newburyport will be on the road versus undefeated Pentucket on the same evening. The Clippers of Coach Gregg Dollas were 13-7 last season while Bob Romeo’s Lady Chieftains were 21-2. Any errors? Let me know. Blogs are very easy to edit. 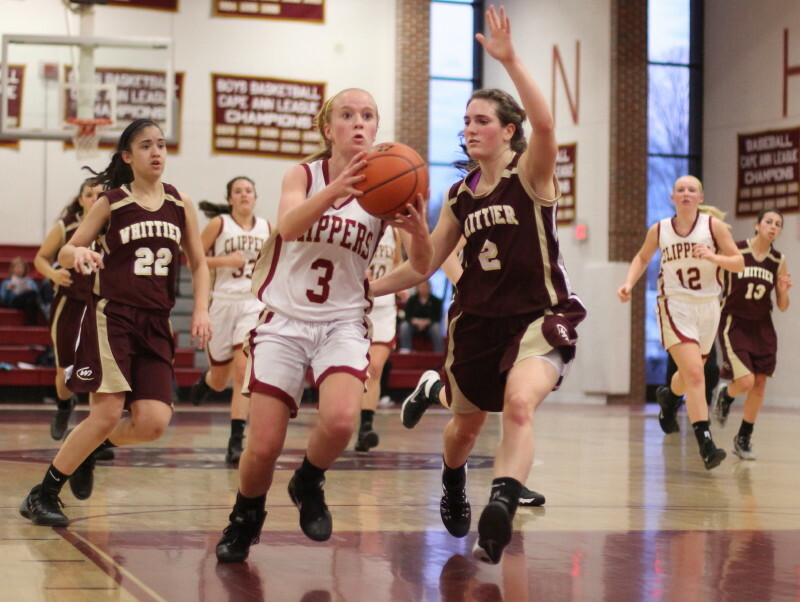 (Newburyport MA) The Whittier Tech girls had ten-point runs in both halves and defeated Newburyport, 57-51, on Monday afternoon in non-league action. The second ten-point streak happened in the final minute and enabled WT to overcome a four-point deficit and pull out a victory. 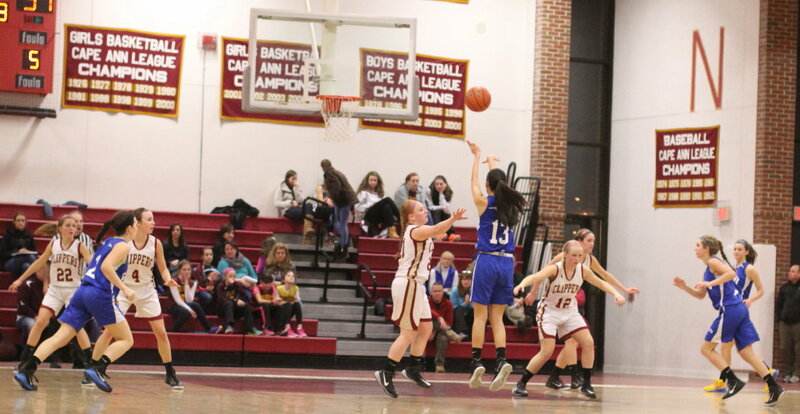 The Wildcats (7-2) had only two three’s in the first three quarters but connected on two straight (Andrea Terranova & Michaela Martin) in the last minute to jump ahead, 53-51, with thirty-two seconds left. 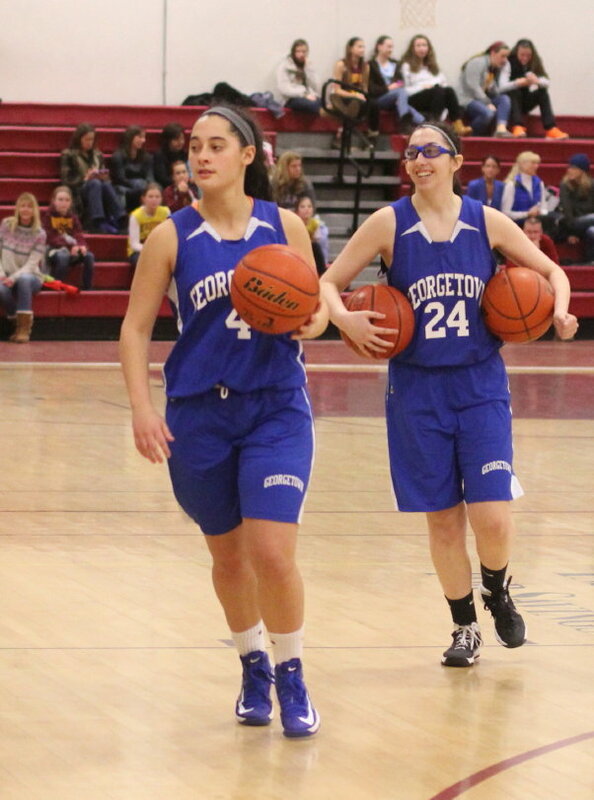 Andrea (16 points) and Michaela (16 points) closed things out with four consecutive free throws. At the same time everything was going right for the visitors from Haverhill, the home-team Clippers (9-3) will do best to forget what happened when they had the ball in the last minute. 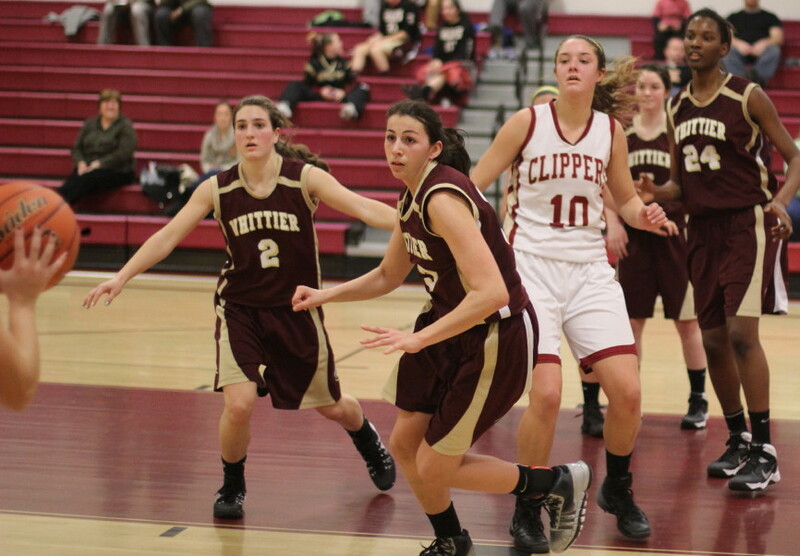 After Whittier’s first three, the Clippers still had a one-point lead (51-50). However, Aly Leahy missed the front end of a one-and-one in the possession before WT’s second three gave them the lead with 32 seconds left. 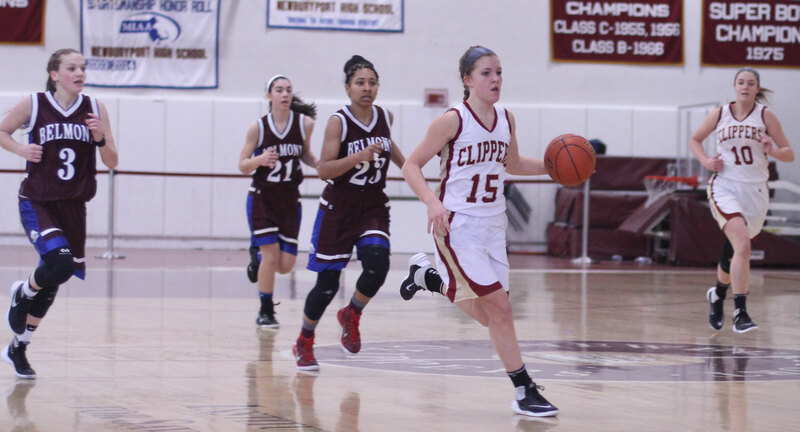 Down by only two (53-51), again with plenty of time to score, the Clippers turned the ball over in the backcourt and fouled the stealer (Andrea Terranova). Andrea made both free throws. Now down four (55-51), Abbie Bresnahan had a shot blocked out-of-bounds by 6-3 Samnell Vonleh. Still time left, Emily Pettigrew traveled. 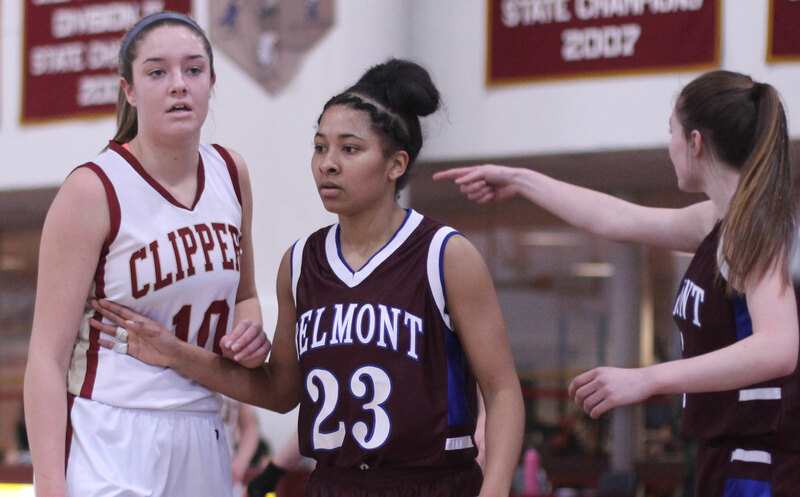 The Clippers were forced to foul and Michaela Martin finished things with two free throws. 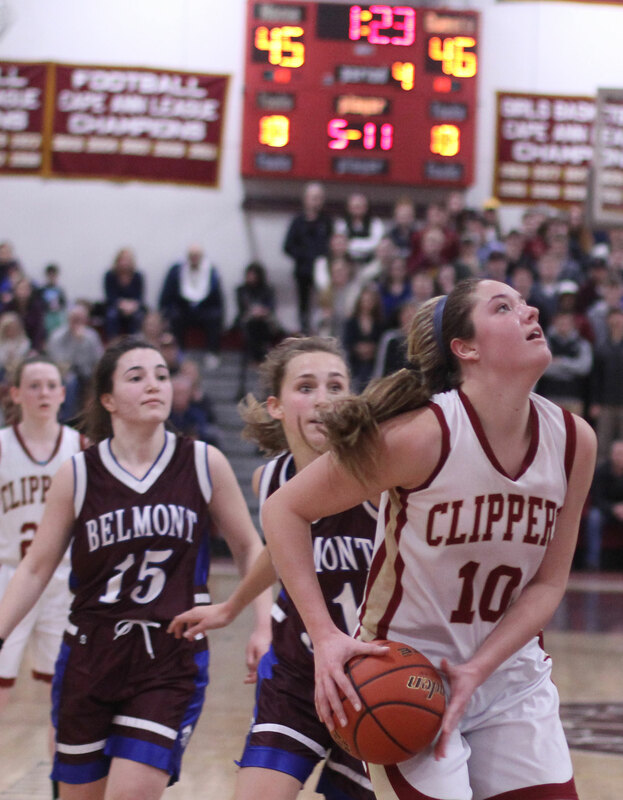 The loss diminished the glow of a terrific performance by Newburyport’s Emily Pettigrew. The 6-foot sophomore tallied twenty-one points and seemed unfazed by WT’s size and physical play. The Clippers built up a ten-point lead (21-11) 1 1/2 minutes into the second quarter. 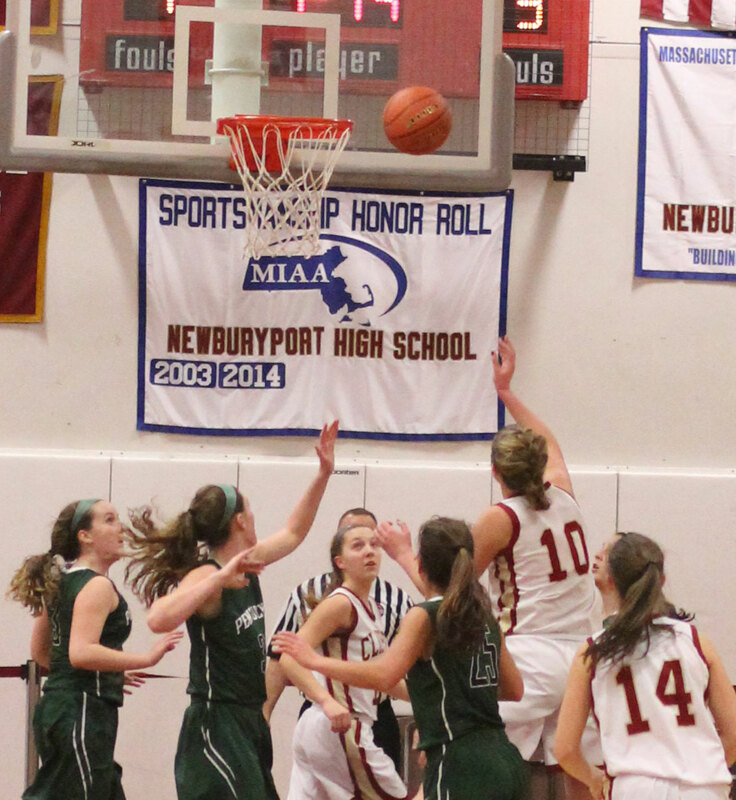 Some of that success for Newburyport was the way Mary Pettigrew kept the Wildcats Michaela Martin in check. 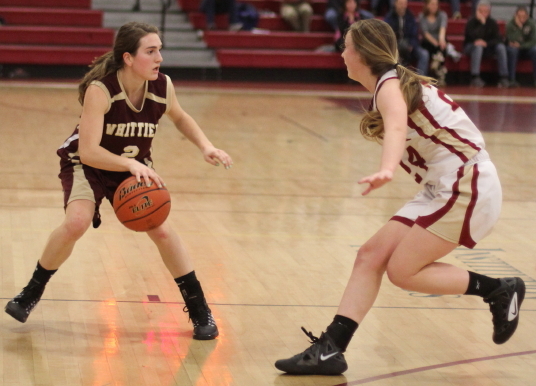 Trailing by ten, Whittier put their first ten-point run together. Two free throws by Andrea Terranova helped but the real damage was done by junior Kayla Riley notching two layups, a free throw, and a three to tie the score at 21-21 three minutes before the half. 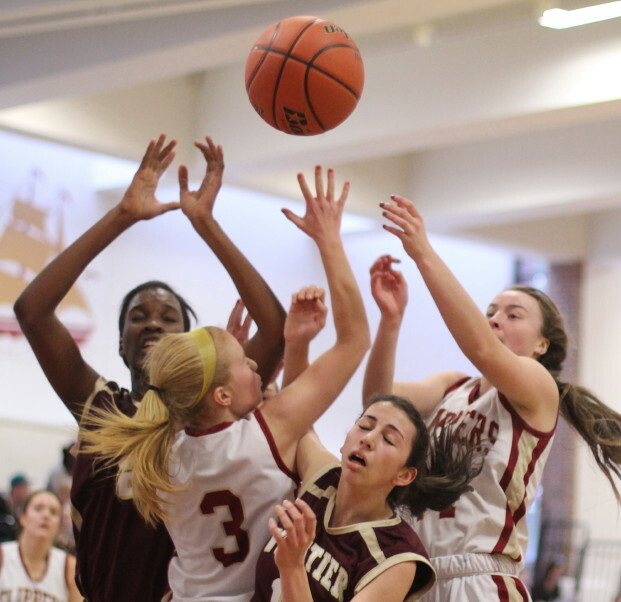 Newburyport had five turnovers and missed the front end of a one-and-one during this segment. It was the Clippers’ turn to put points together in the third quarter after trailing, 31-27. A nine-point streak featured an old-fashioned three by Abbie Bresnahan (9 points) and a normal three by Aly Leahy (13 points). 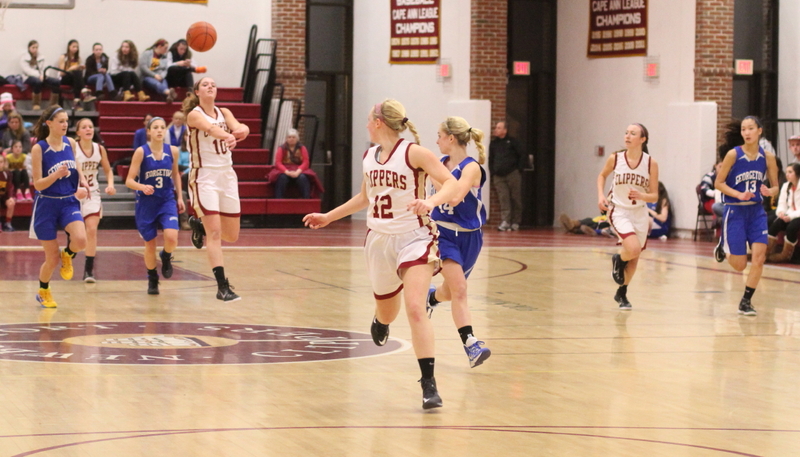 This collection of points put Newburyport ahead, 36-31, with a minute left in the third quarter. The Clippers were able to hold onto the lead until the final minute of the game. Both teams pressed and pressured wherever the ball was. Neither team was very successful, as a result, in getting clean looks. 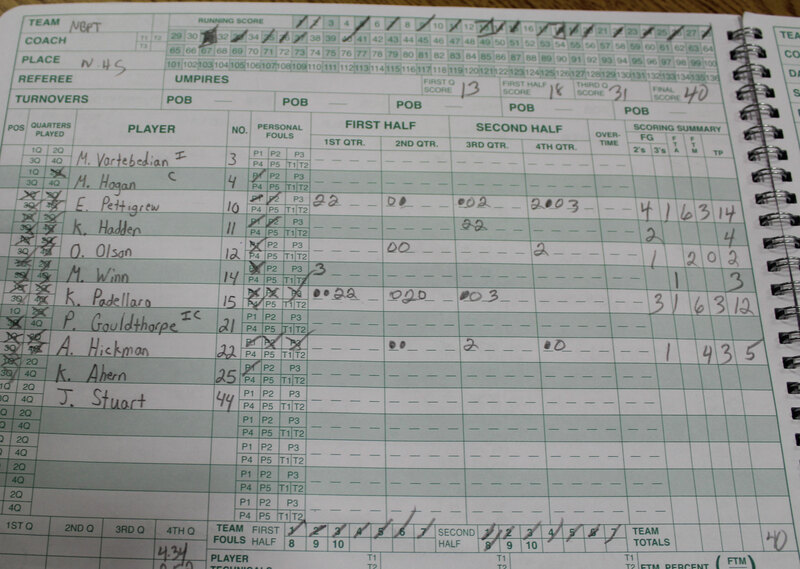 The usual result was a shot in traffic or a turnover. The two teams combined for an unspectacular FIFTY turnovers. Newburyport had 27 and Whittier 23, by my unofficial count. Both teams missed seven free throws. WT, however, connected twenty-three times including seven-of-eight in the final minute. The Clippers hit nine free throws. I was impressed by the speed and spark of sophomore Abbie Bresnahan. 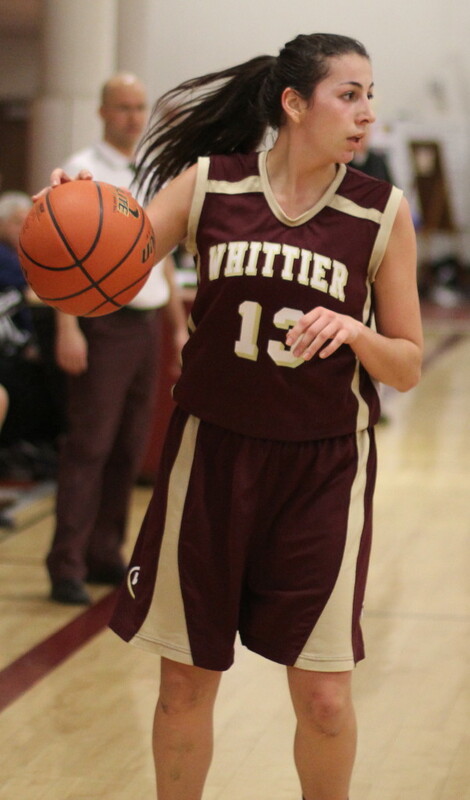 Whittier has now won four straight. They were 22-2 last season, losing in the Division 4 North final. It is not hard to imagine the Wildcats doing well in the state tournament again this year. The Clippers will have to wait another day to qualify for the state tournament. They need one more win to get there. 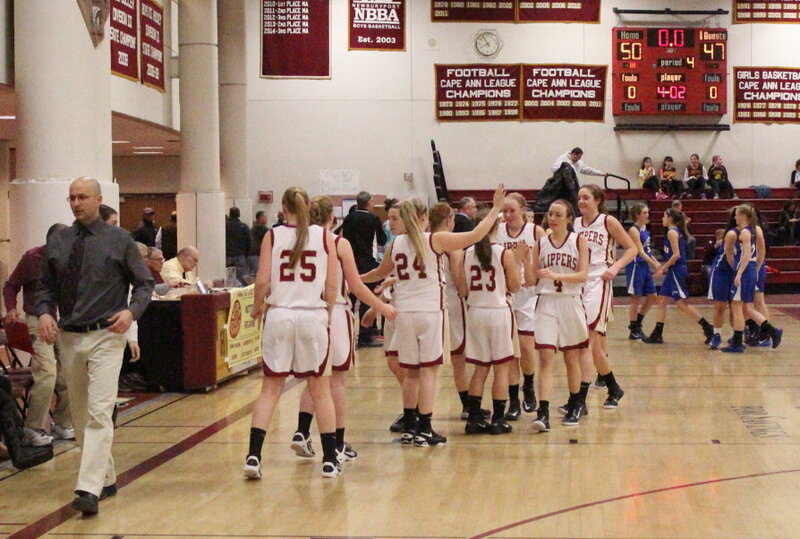 They are scheduled to face Amesbury on Friday night (7PM) in their next game. 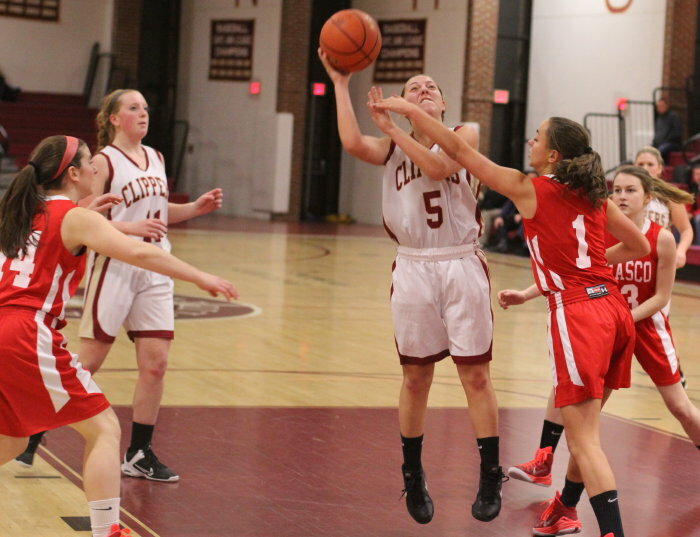 Whittier is scheduled to host non-league Gloucester on Wednesday (5:30PM). Michaela Martin was a Lawrence Eagle Tribune All-Star last season. 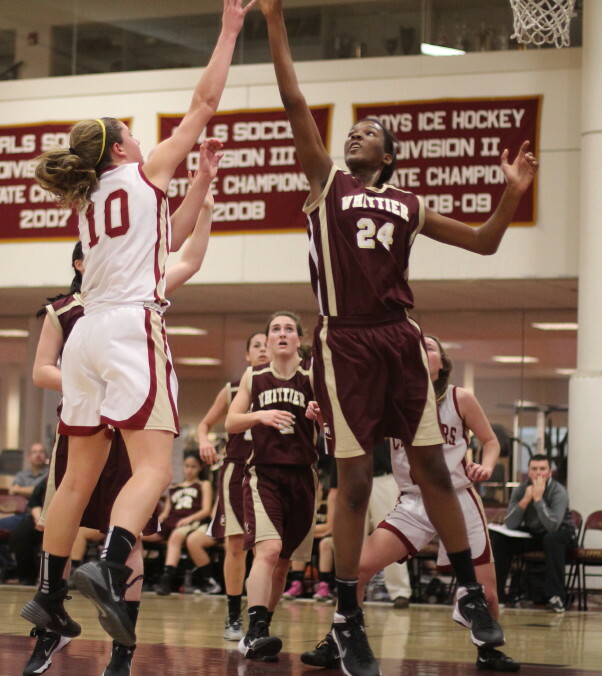 Juniors Kayla Riley, Andrea Terranova, and Samnell Vonleh were Commonwealth Athletic Conference All-Stars in 2012-13. WT has no seniors on their roster.